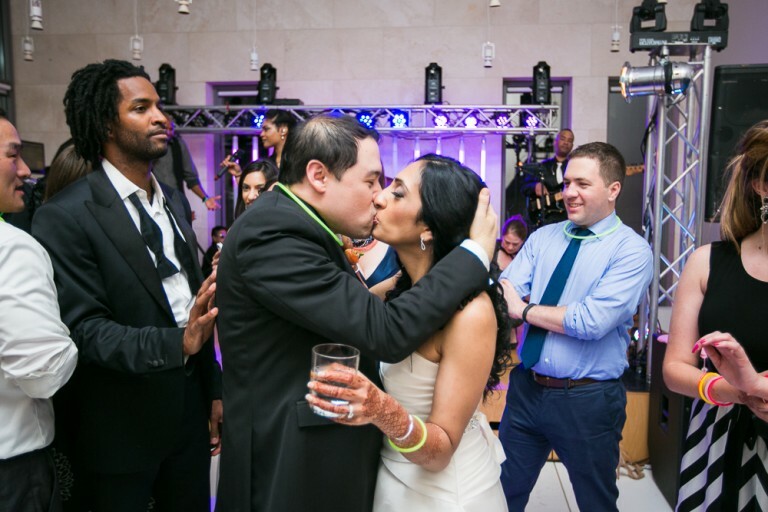 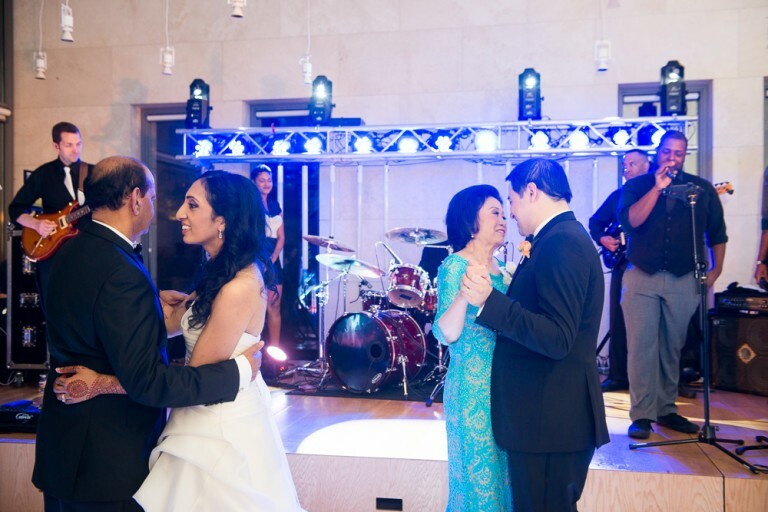 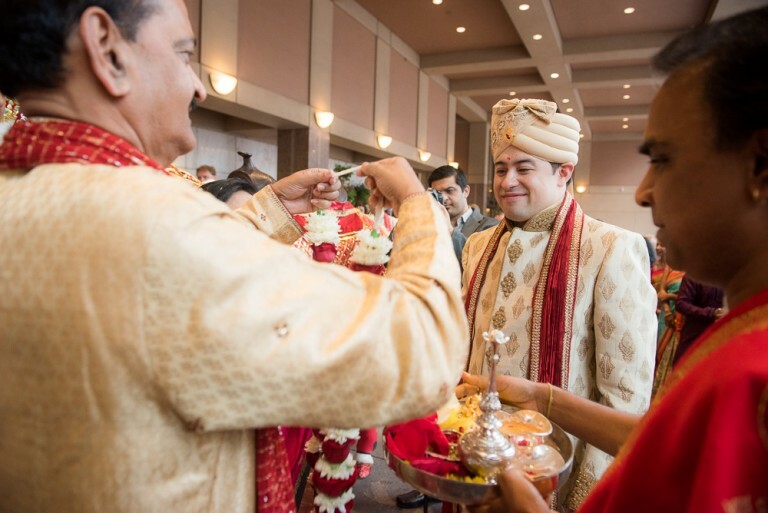 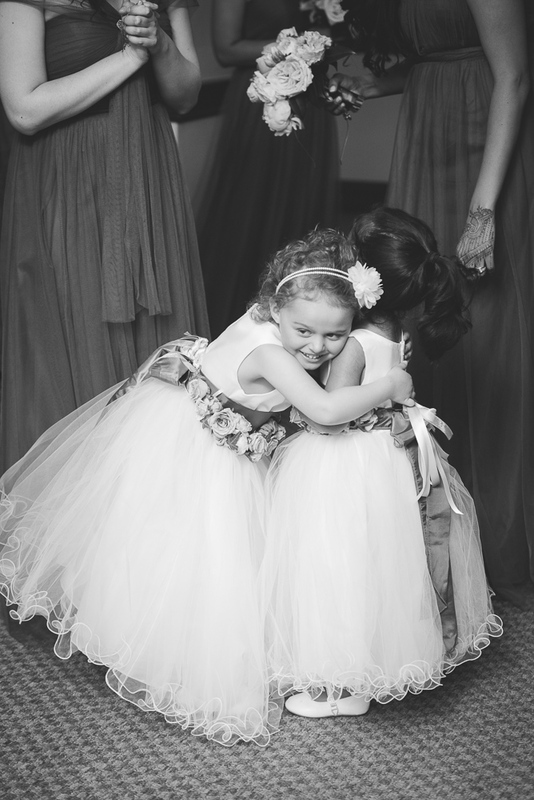 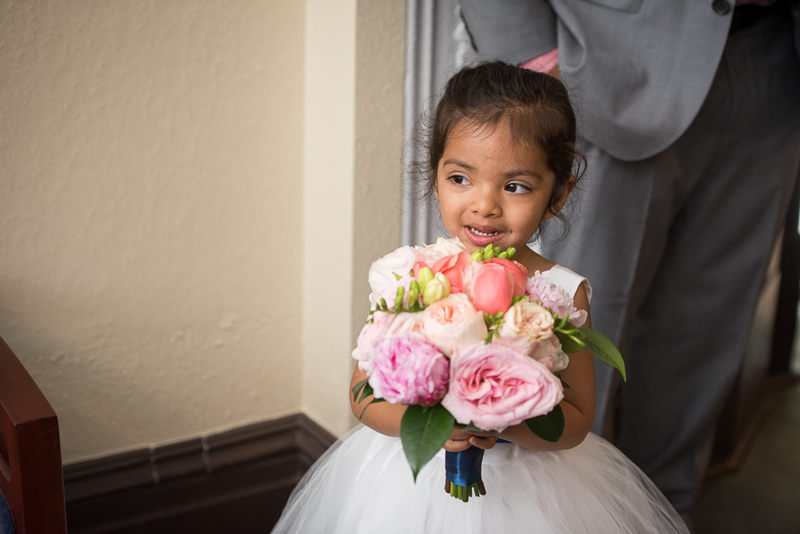 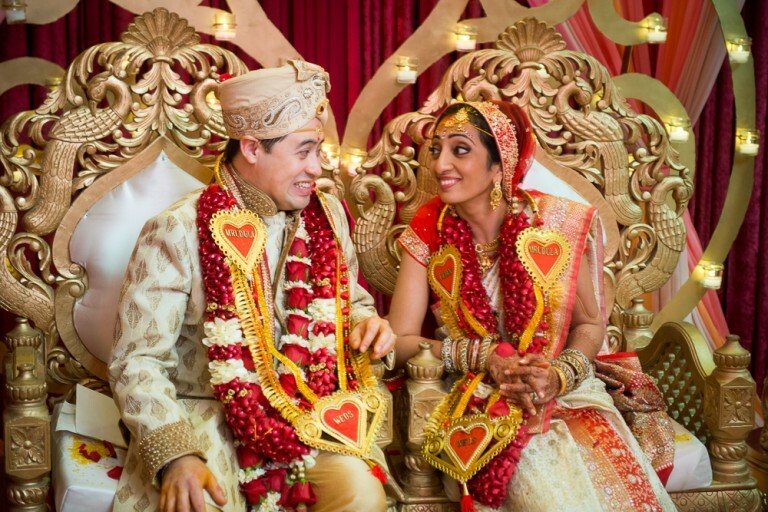 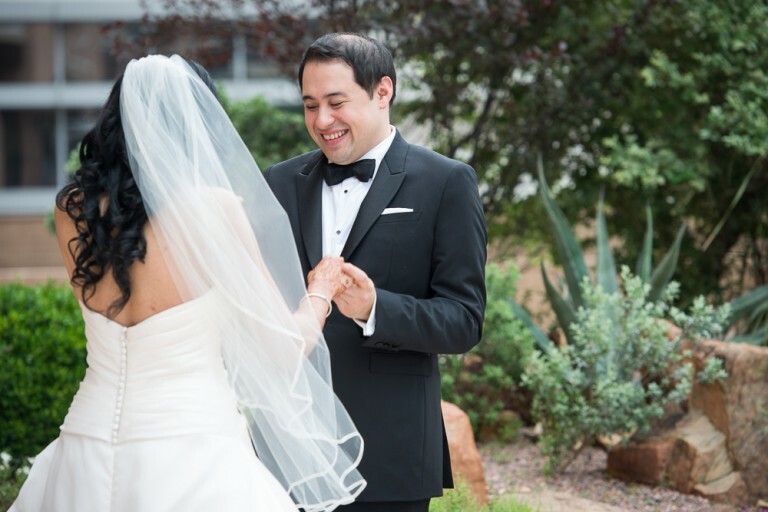 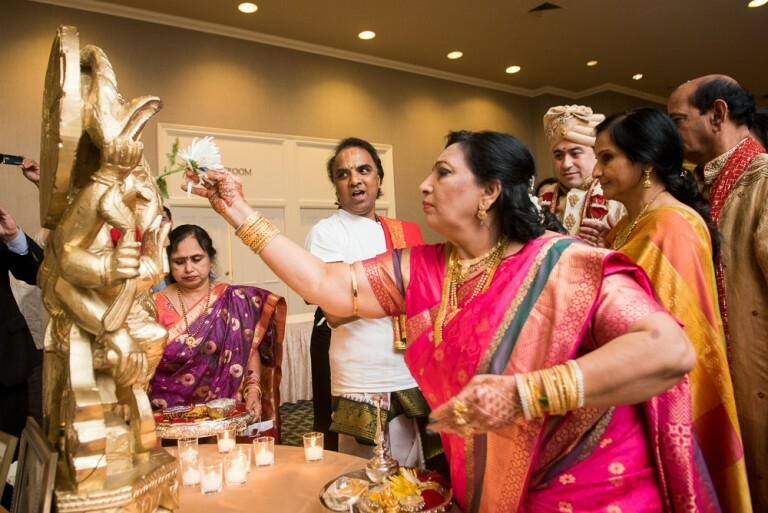 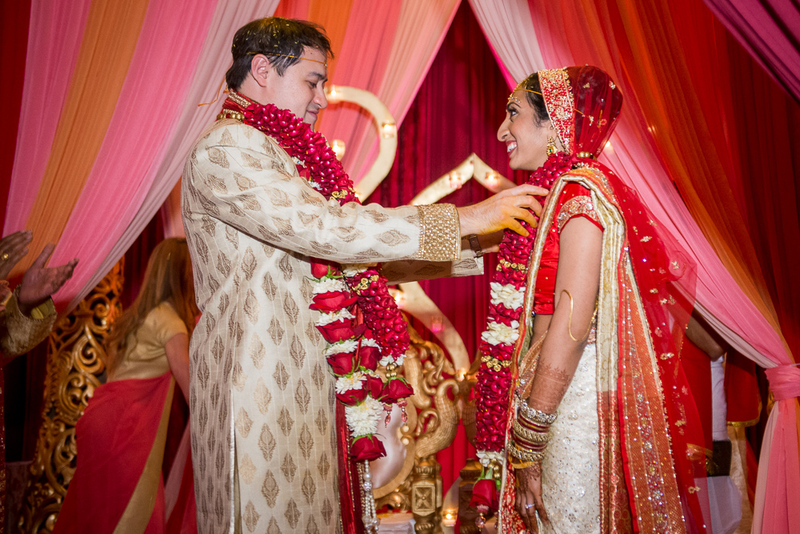 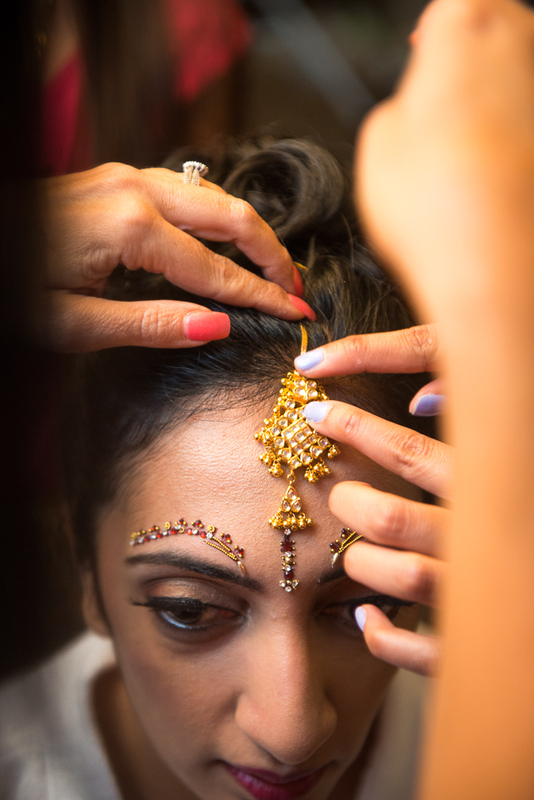 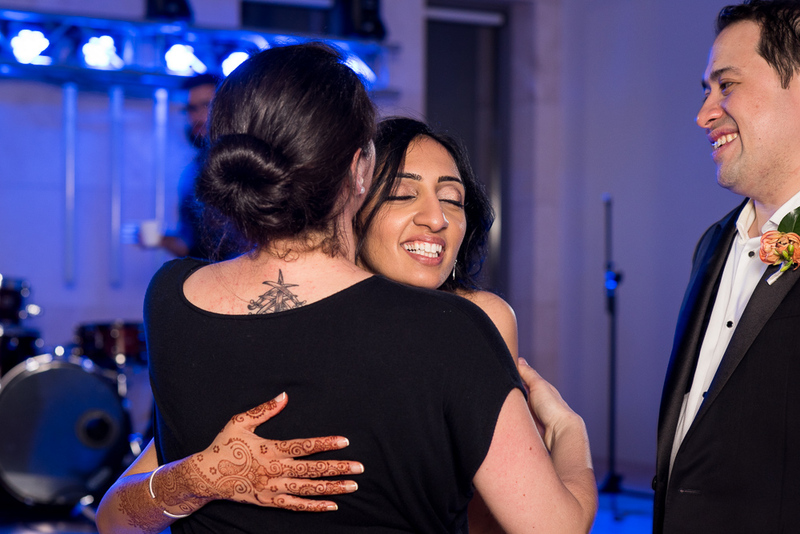 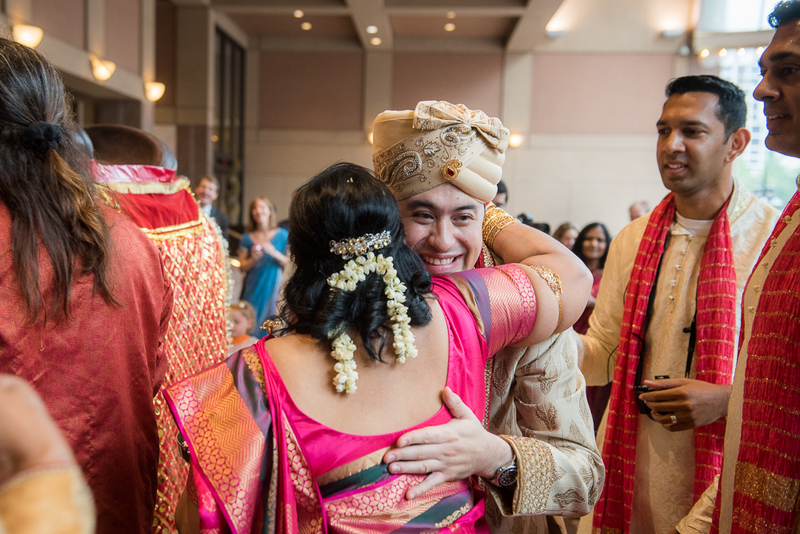 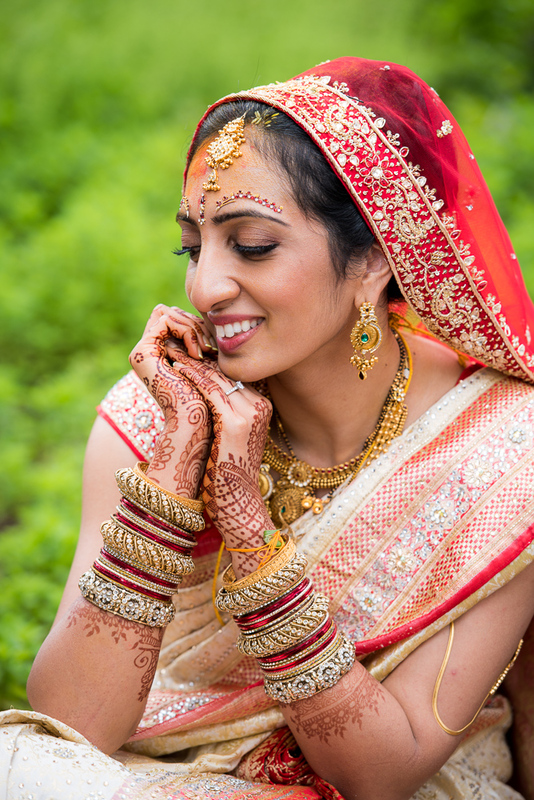 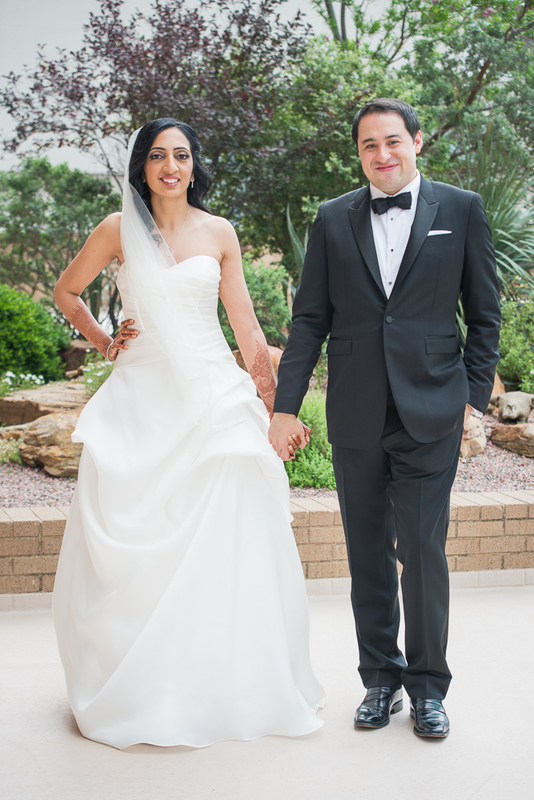 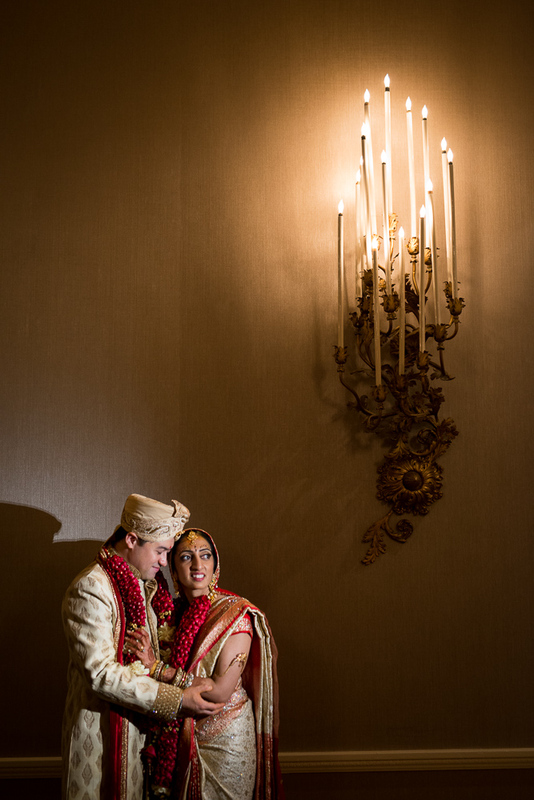 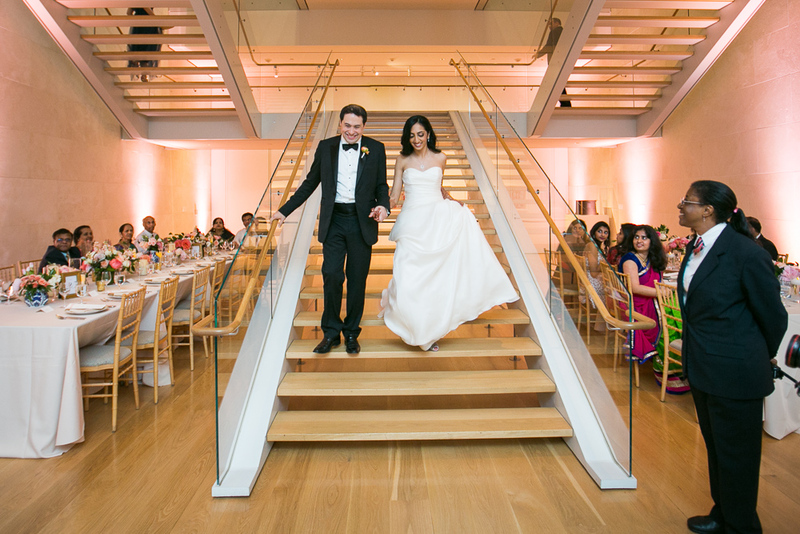 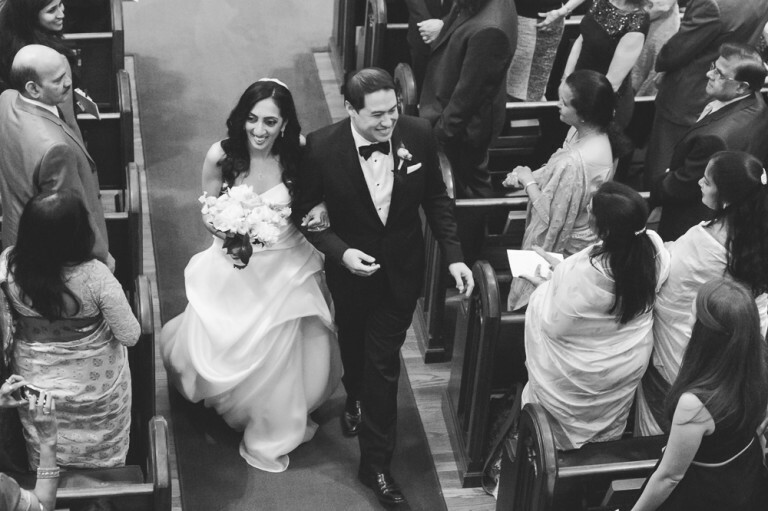 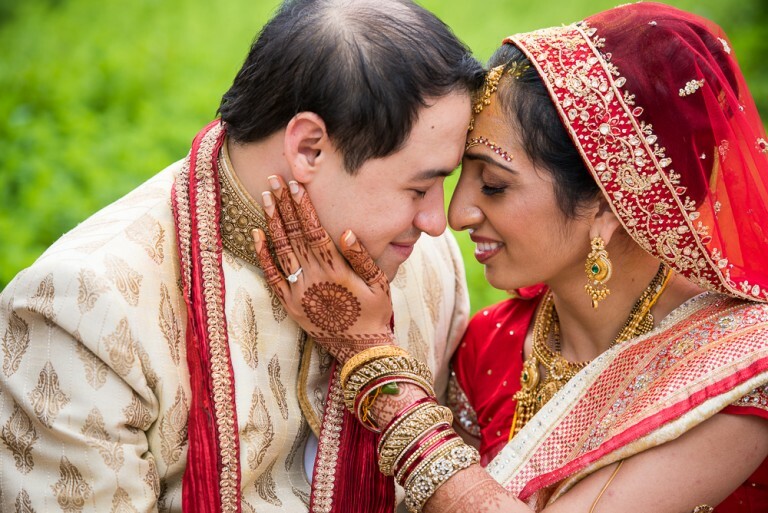 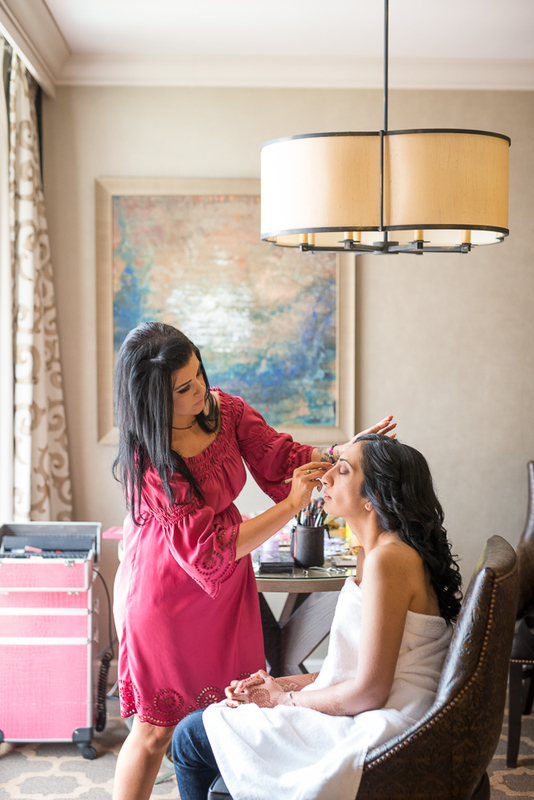 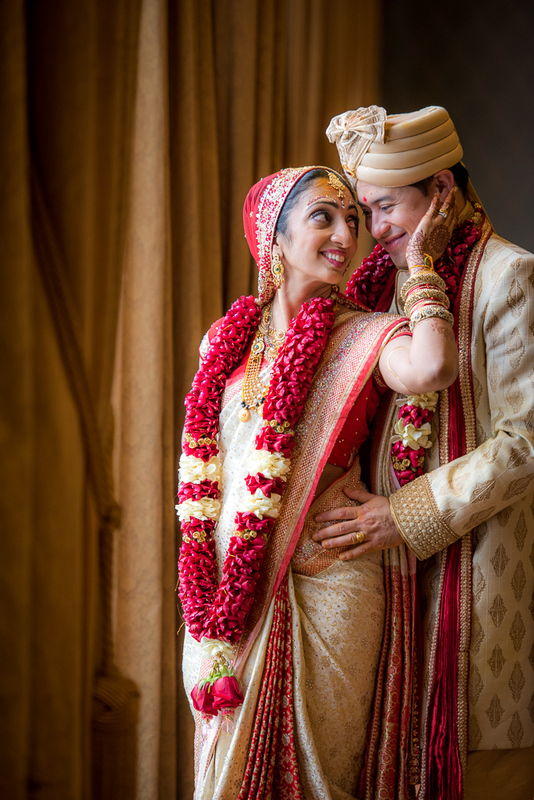 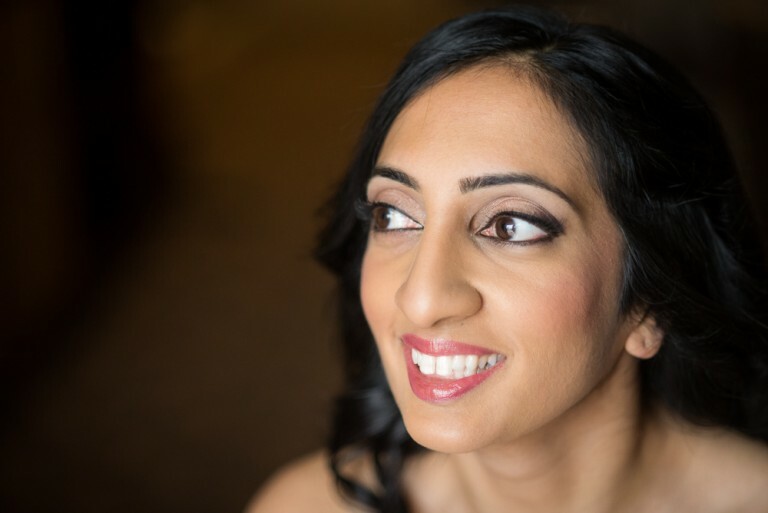 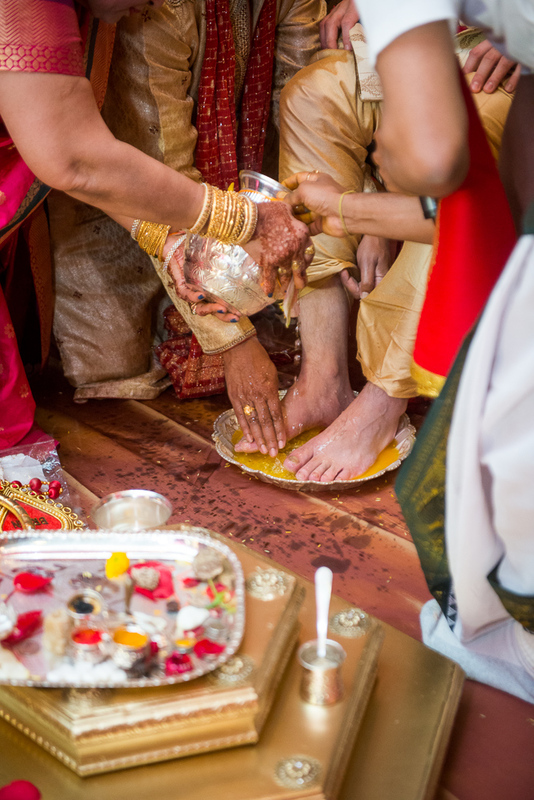 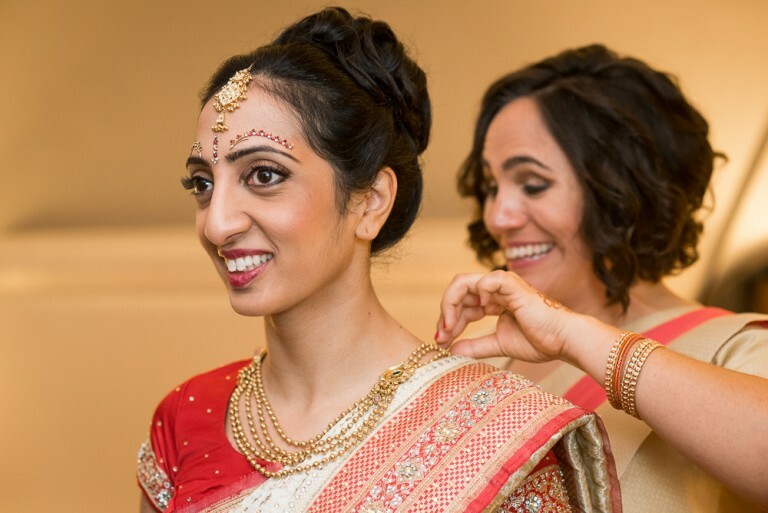 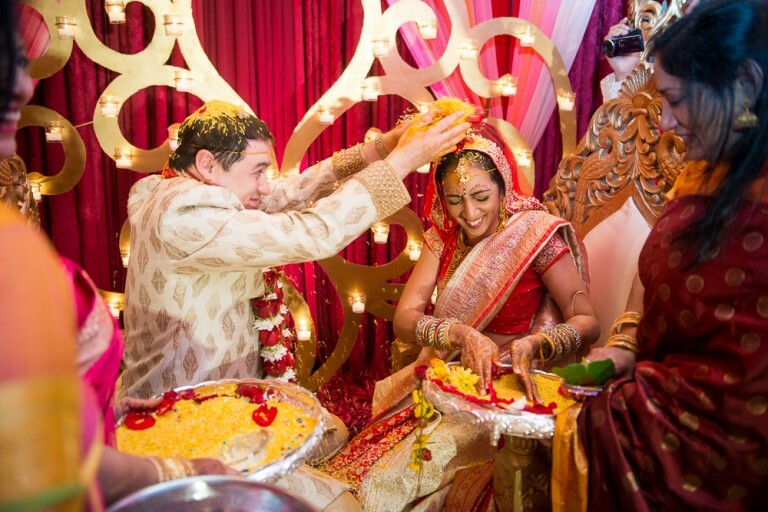 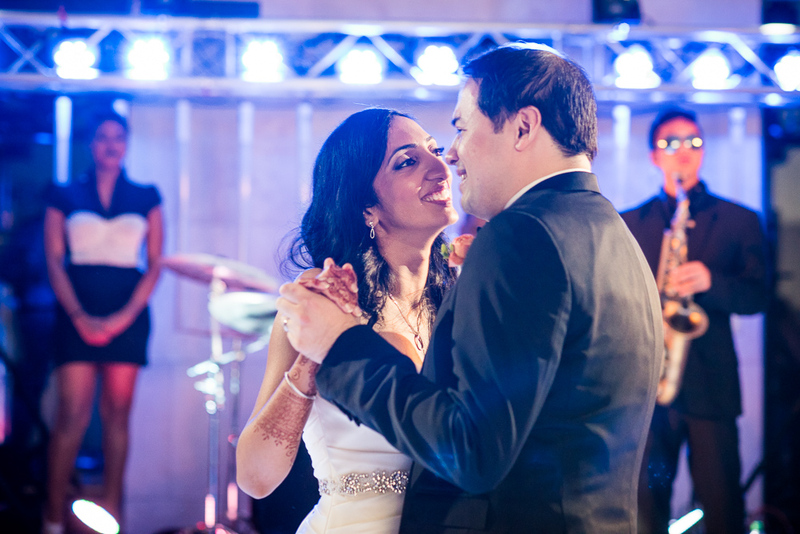 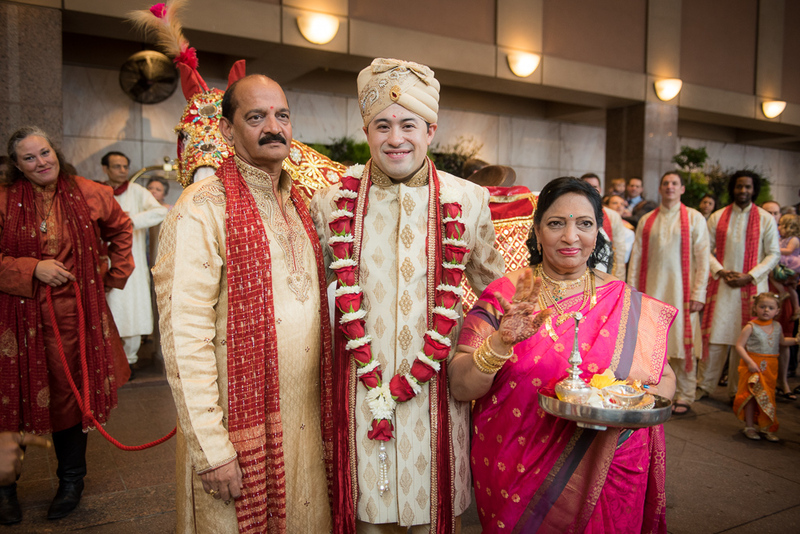 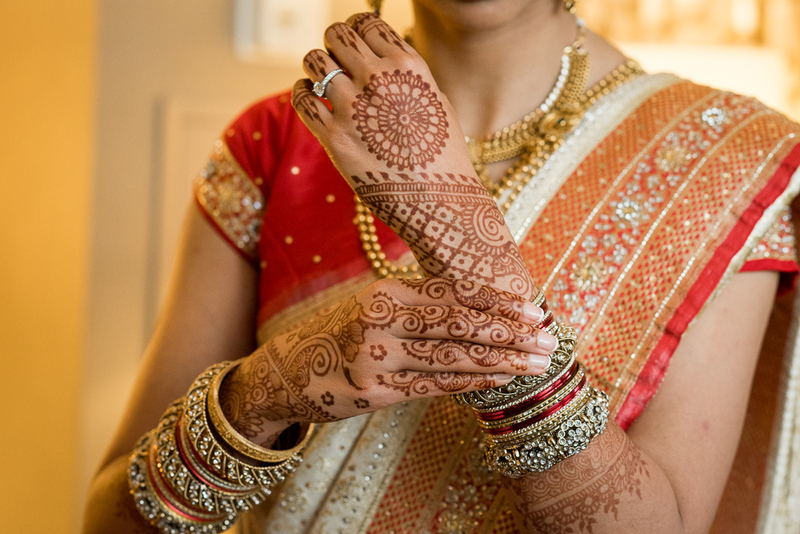 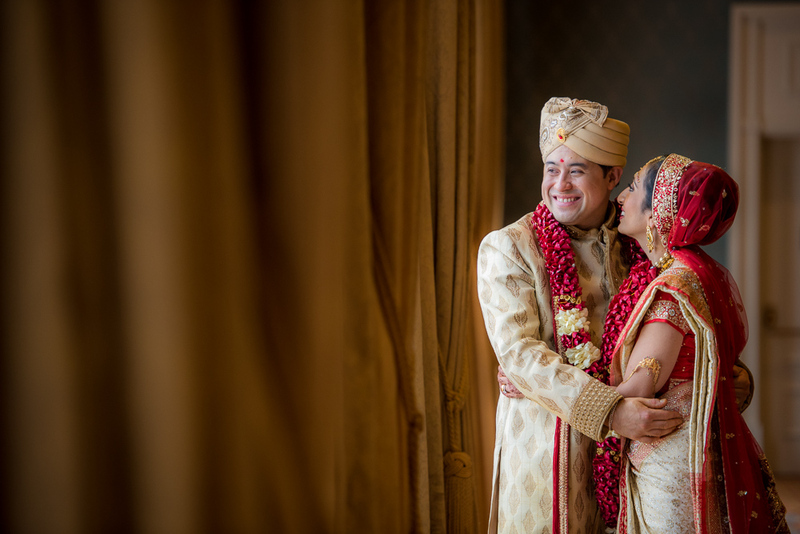 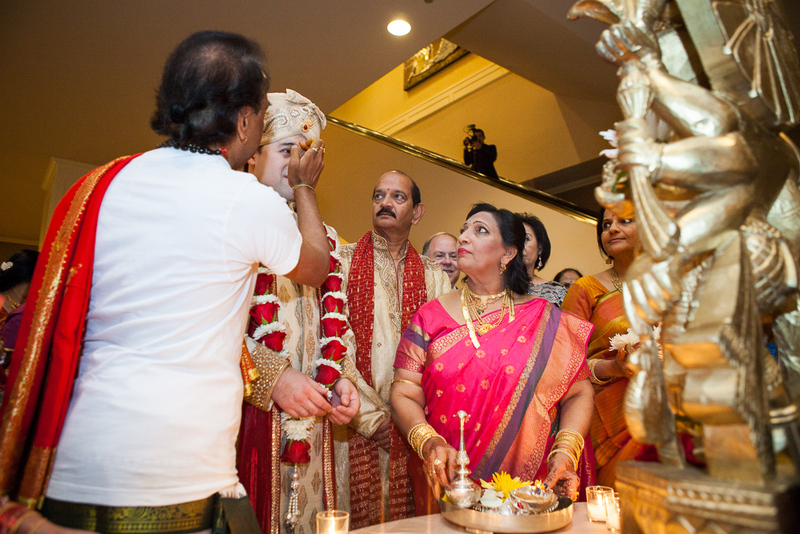 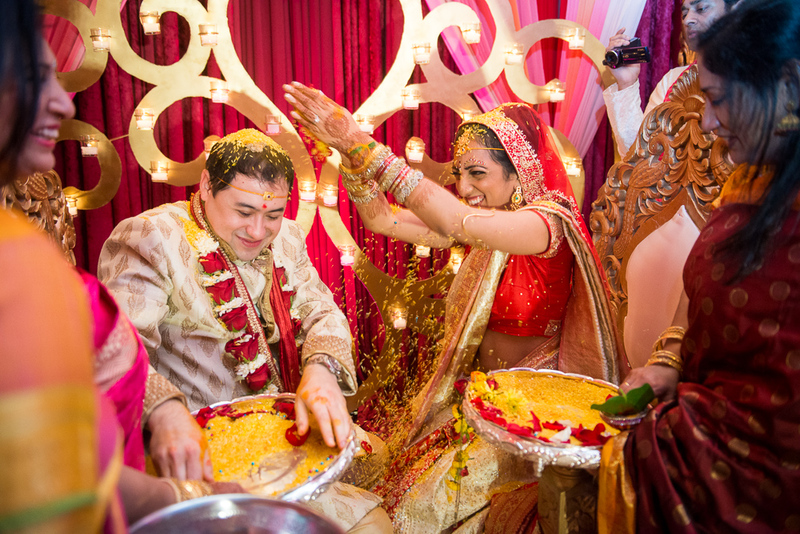 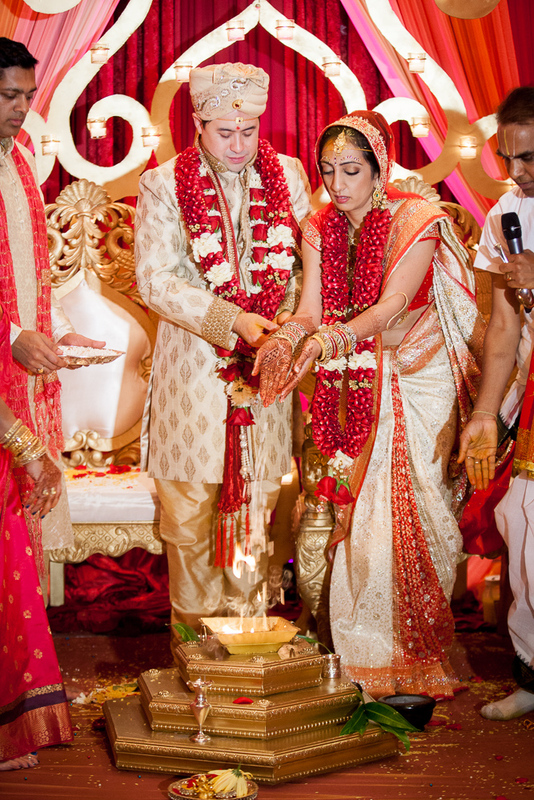 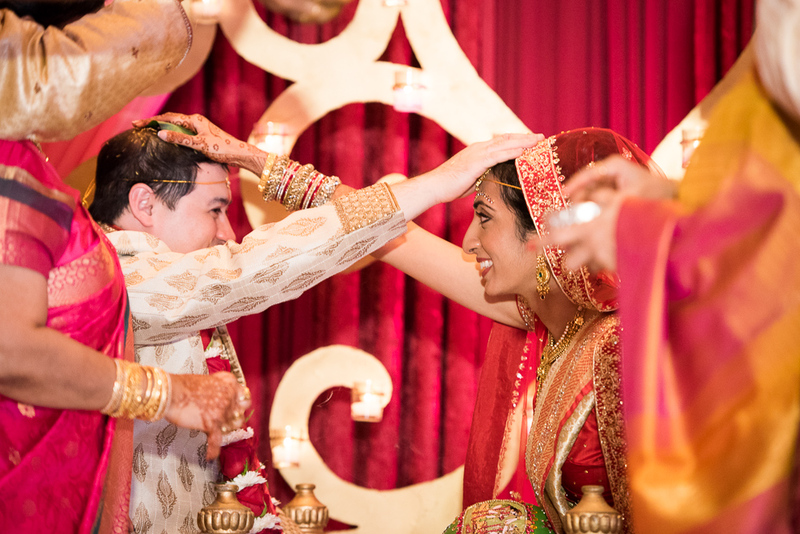 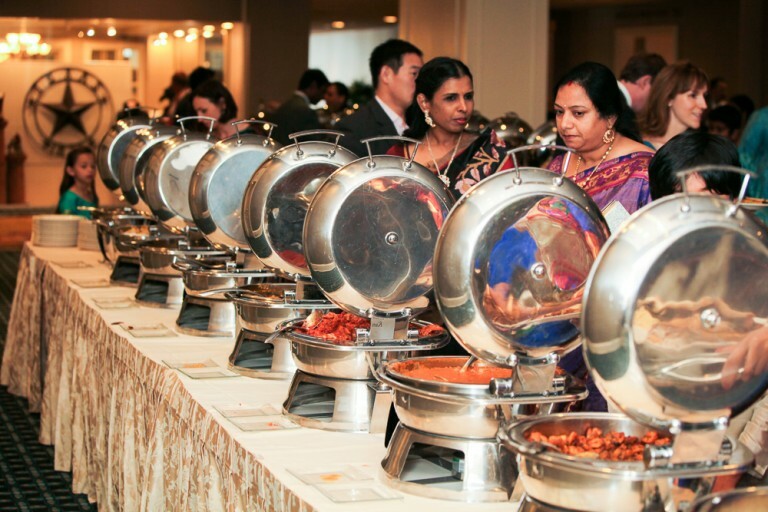 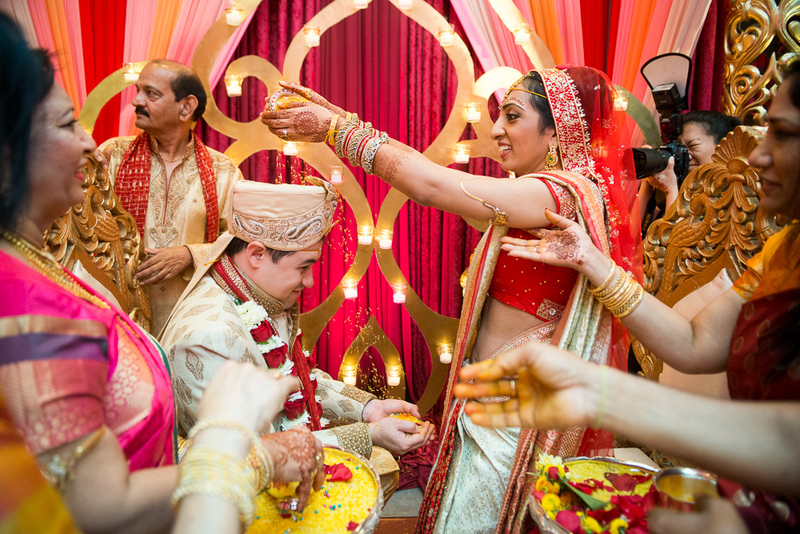 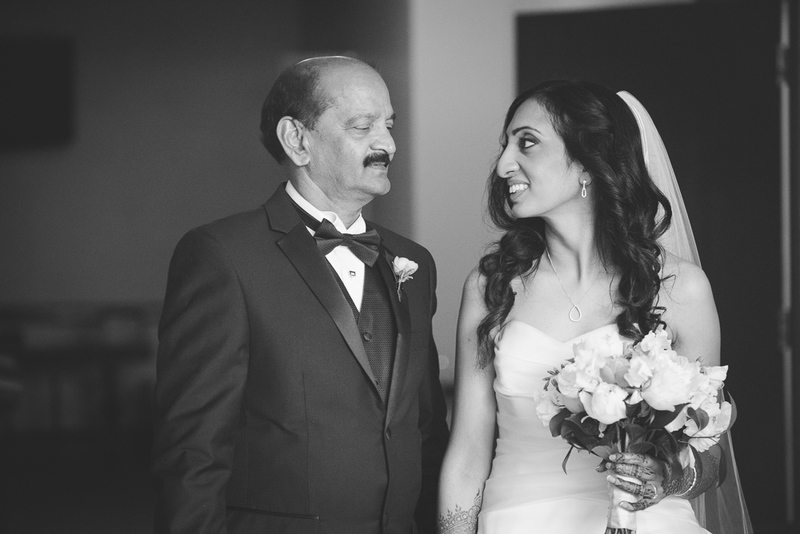 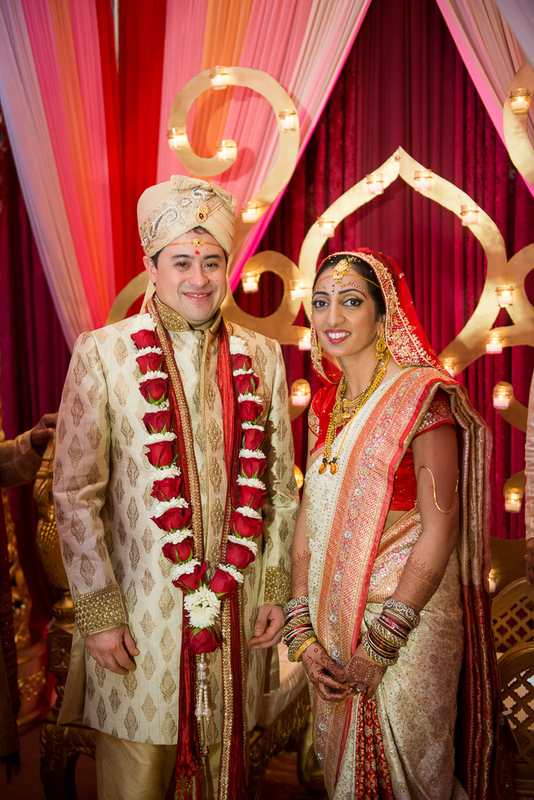 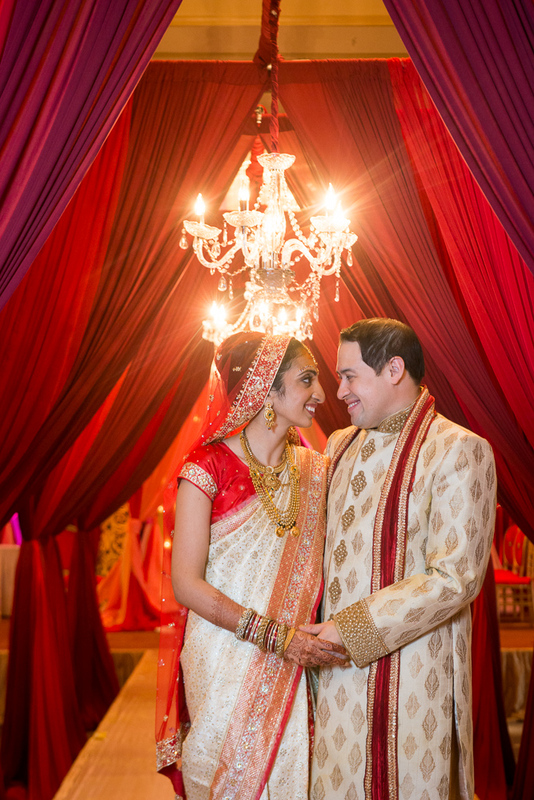 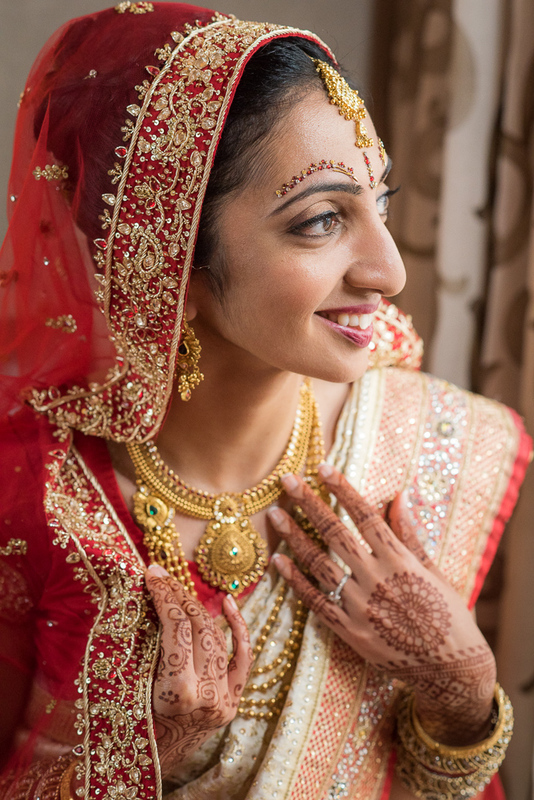 When Mrudula and Brian became engaged, they knew their wedding would need to incorporate elements of Mrudula’s Indian Hindu heritage and Brian’s Christian upbringing to Asian and Caucasian parents. 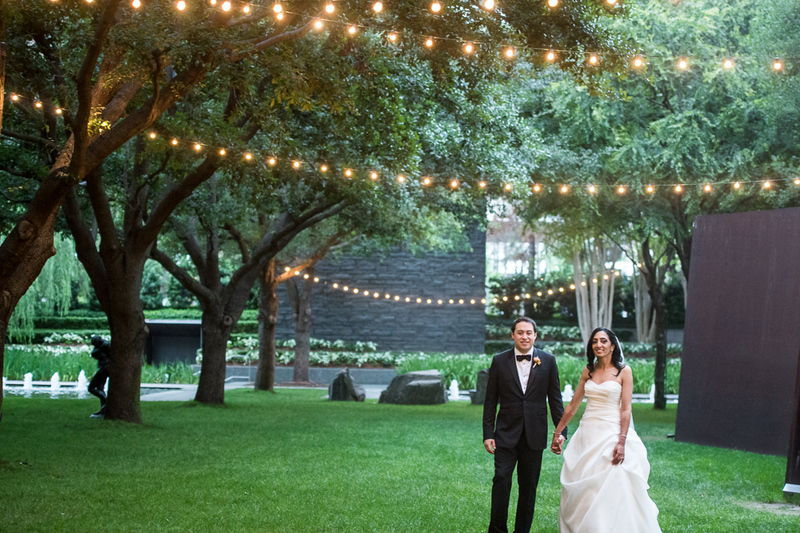 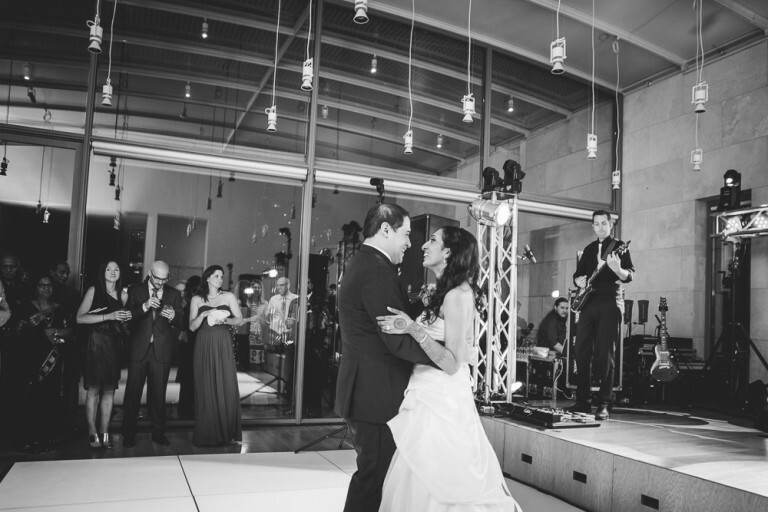 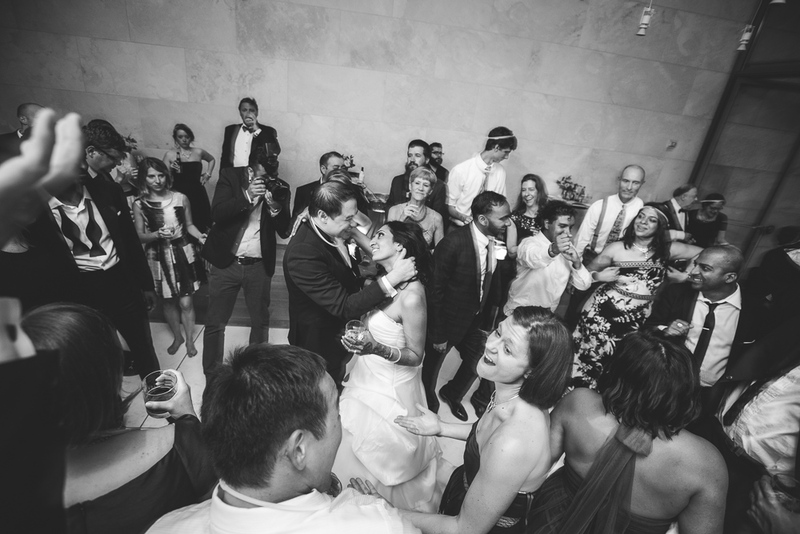 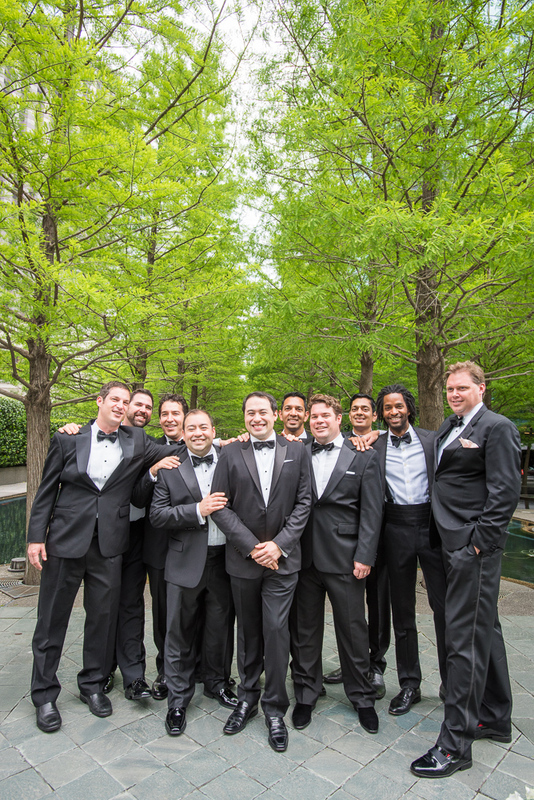 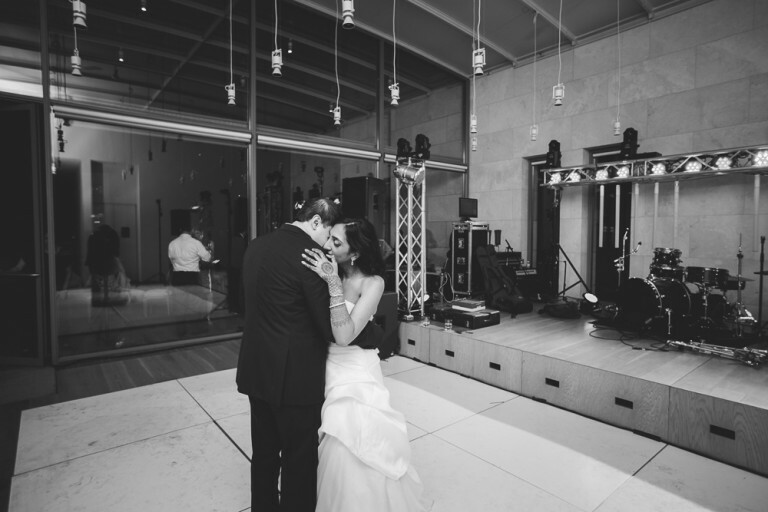 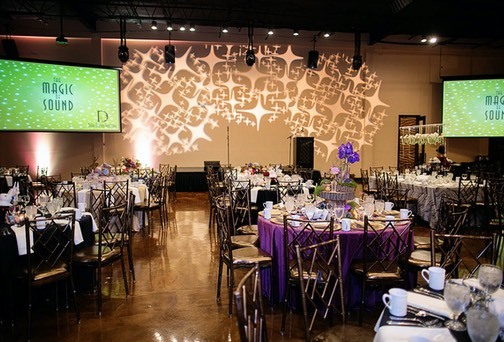 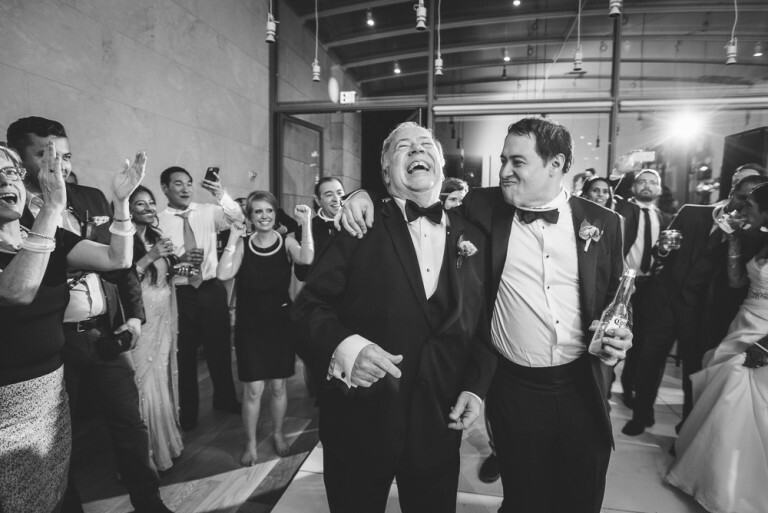 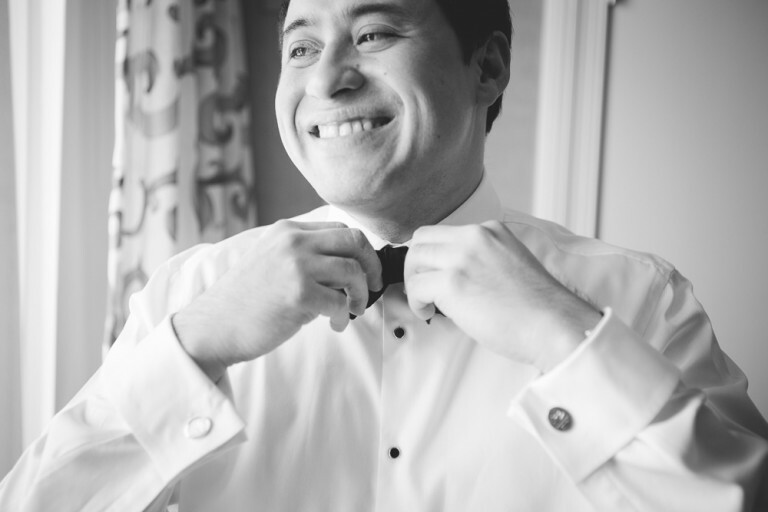 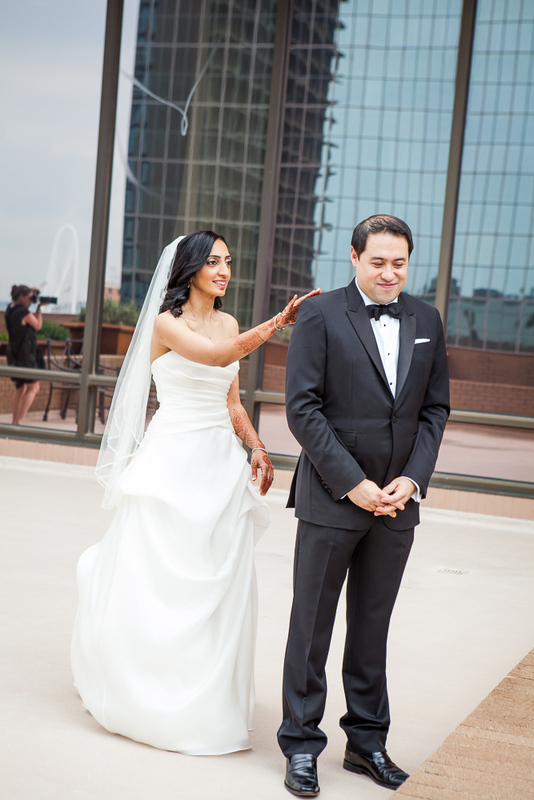 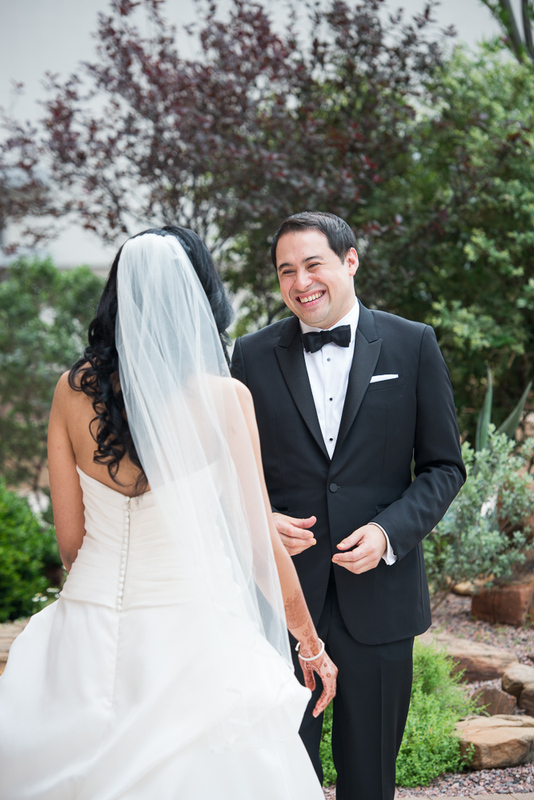 We decided on a day that would encompass two ceremonies and two receptions, all in the heart of Dallas’s famed Arts District. 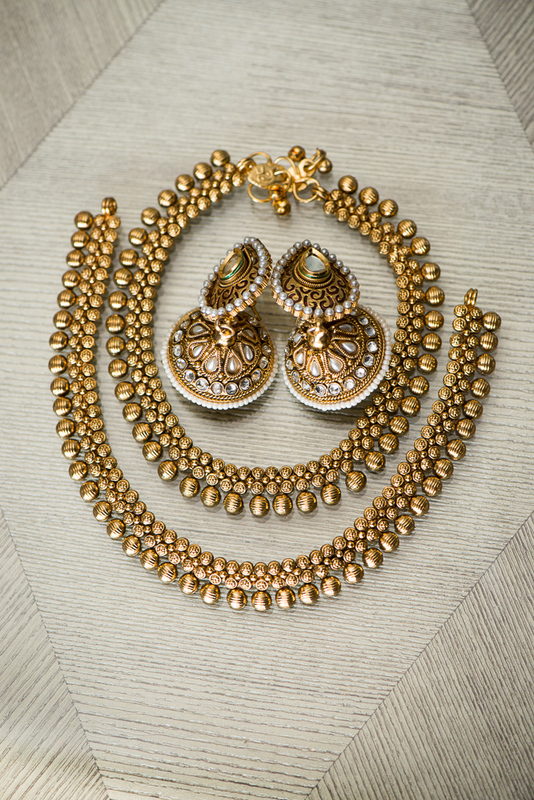 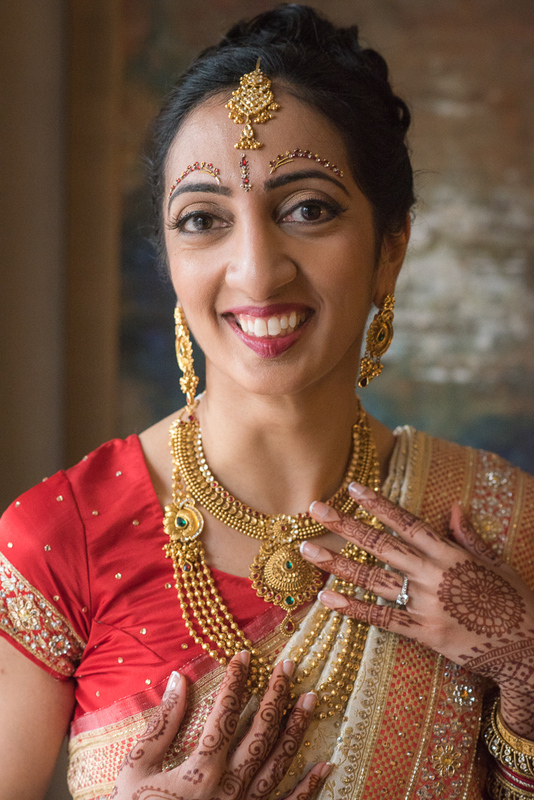 After getting her beautiful henna work done and getting dressed head to toe in jewelry and a stunning gold and red Sari it was time for Mrudula to be carried into her Hindu wedding ceremony. 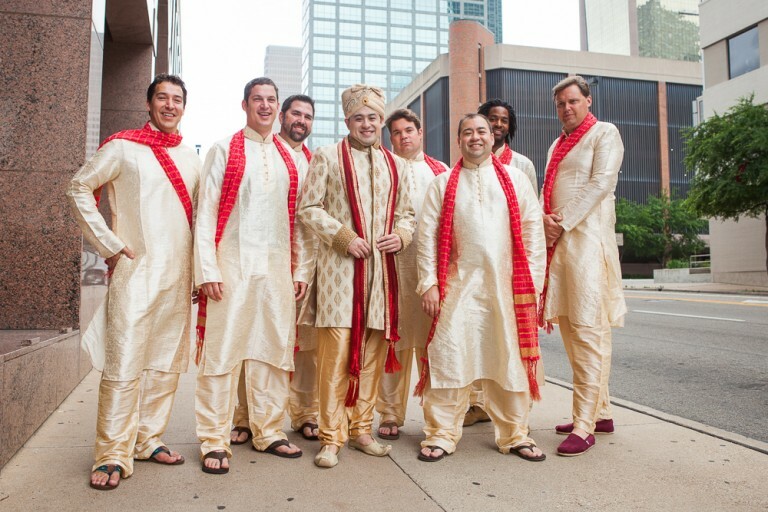 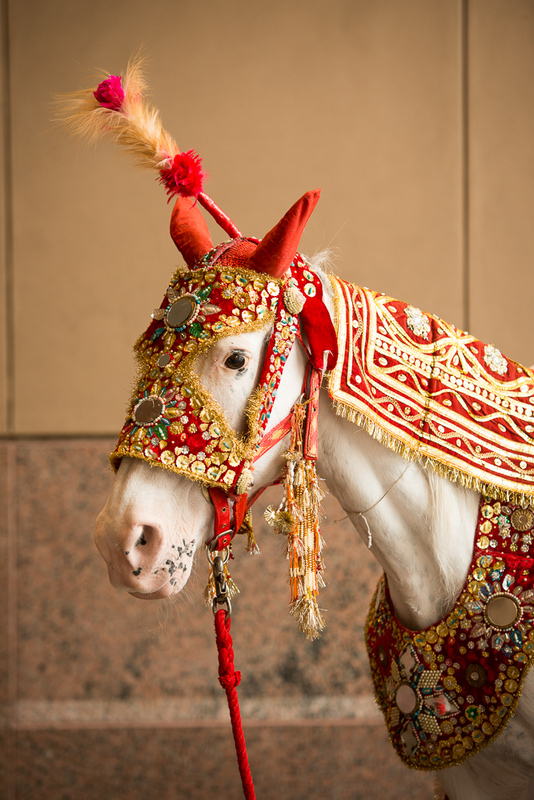 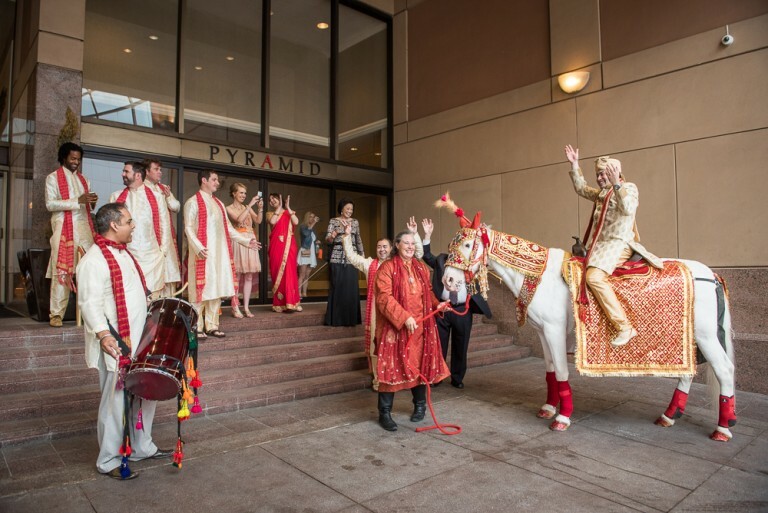 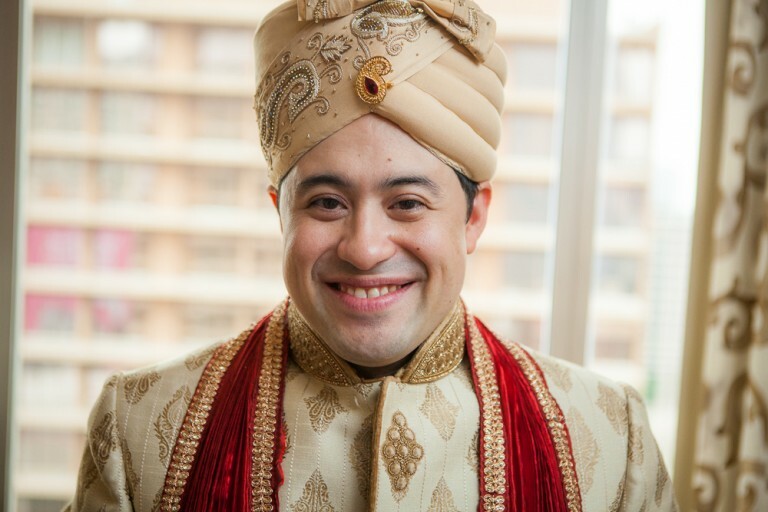 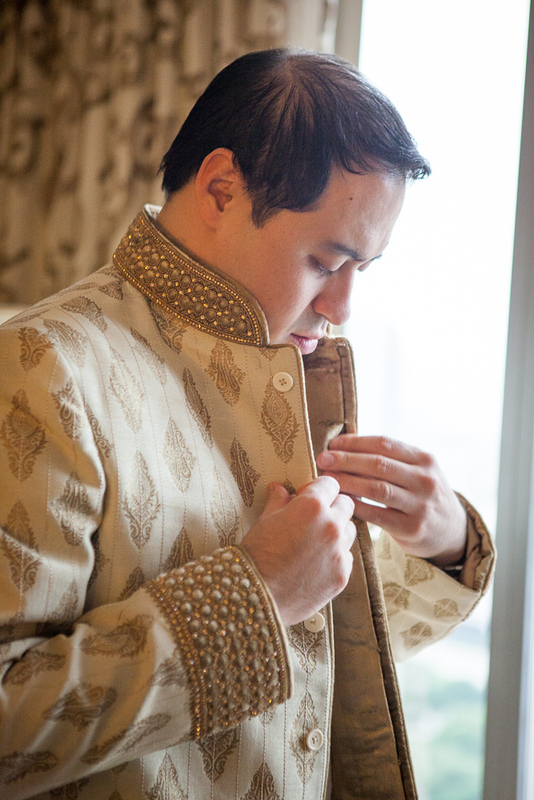 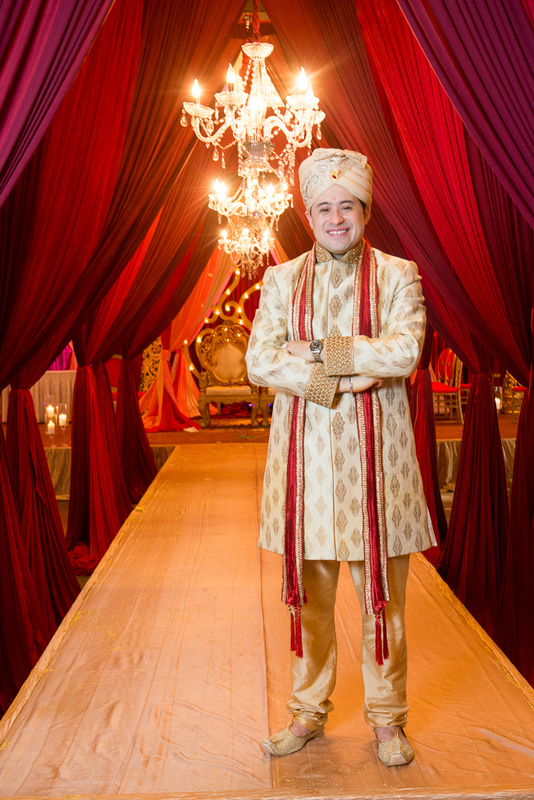 First, a festive Baraat was held outside of our ceremony venue, with Brian dressed in traditional Indian wedding attire sitting atop a costumed white horse. 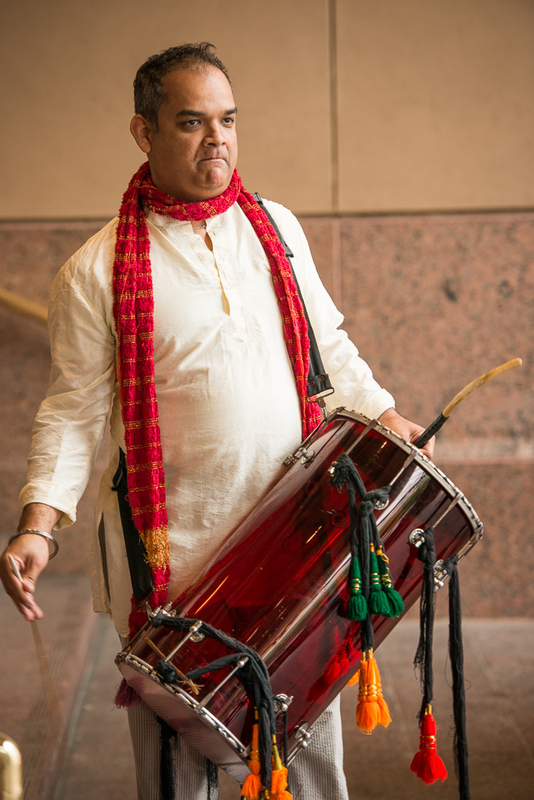 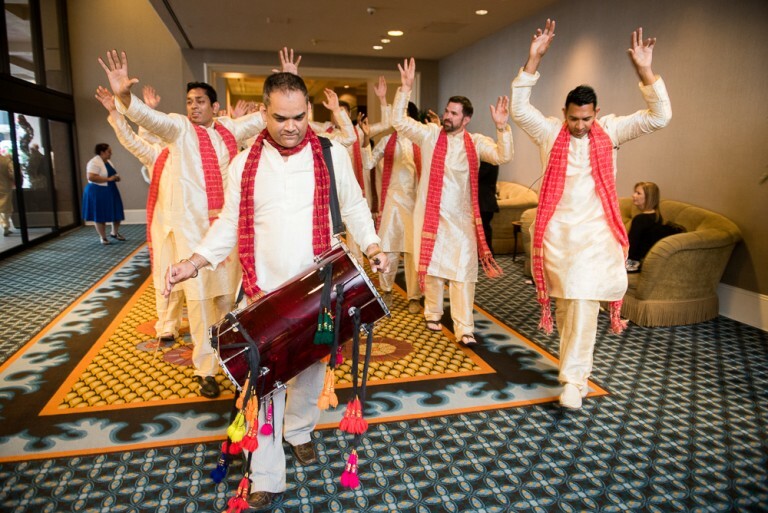 A Dholi played the drums as guests clapped and celebrated Brian being formally received by Mrudula’s parents who then brought him into the ballroom and to the incredible Mandap. 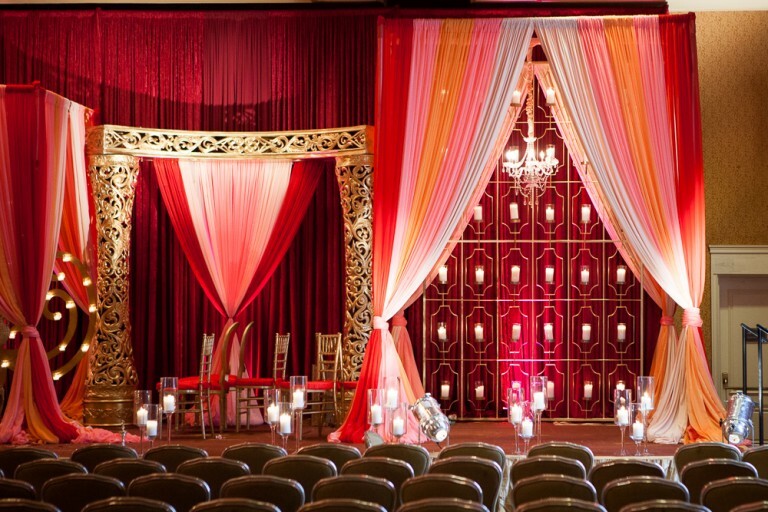 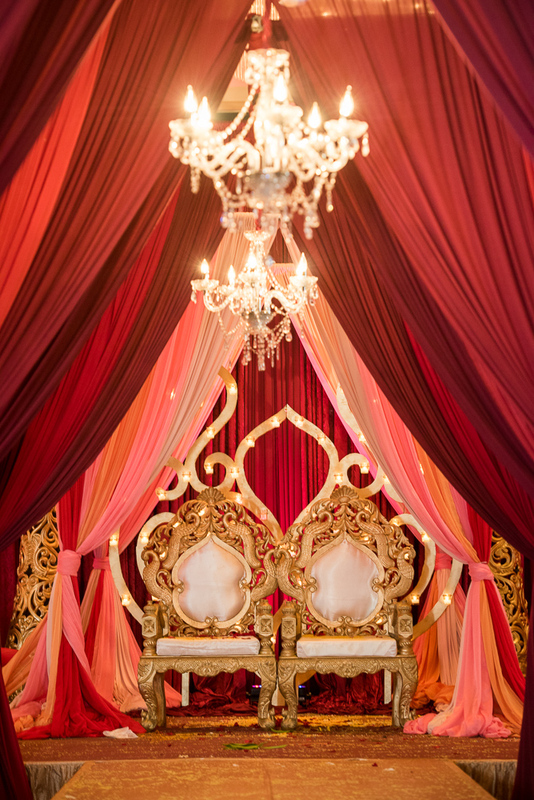 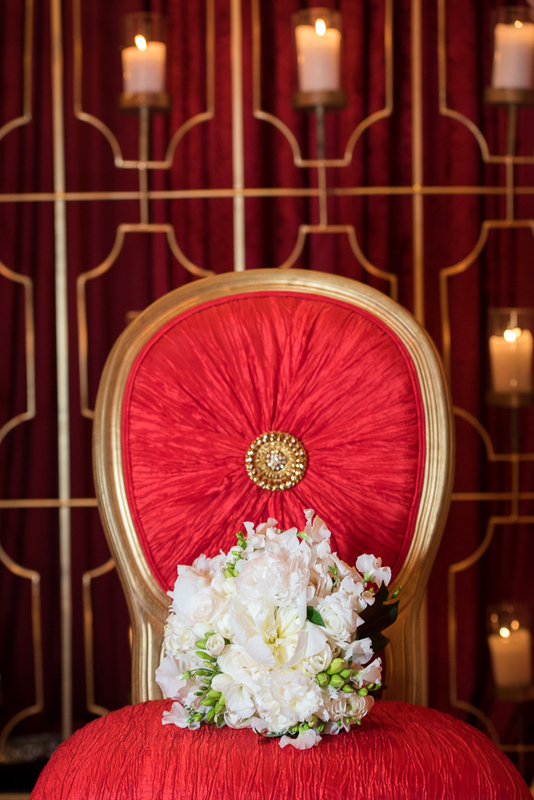 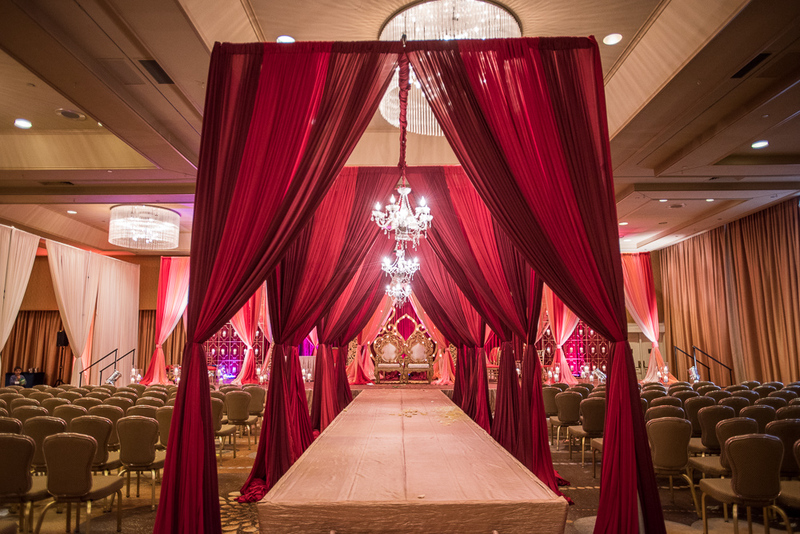 The entire ballroom was adorned with an ombre Mandap complete with walls of candles, elegant chandeliers, and hand-crafted gold thrones for the bride and groom. 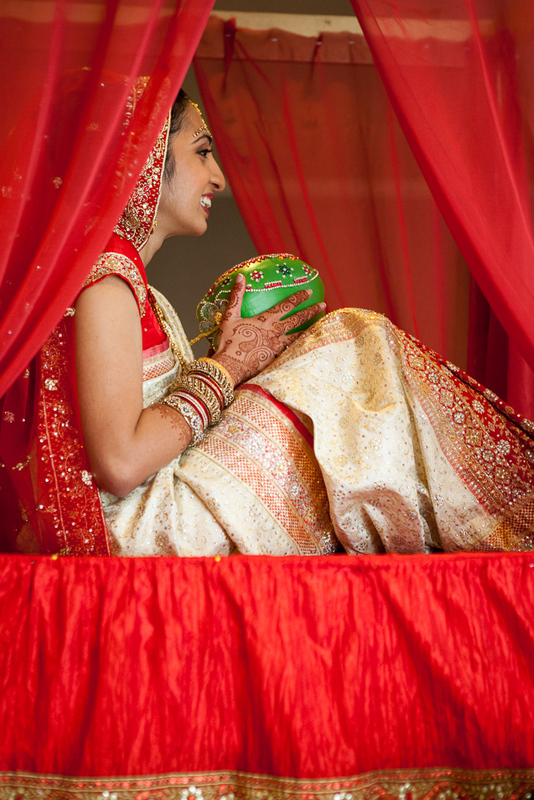 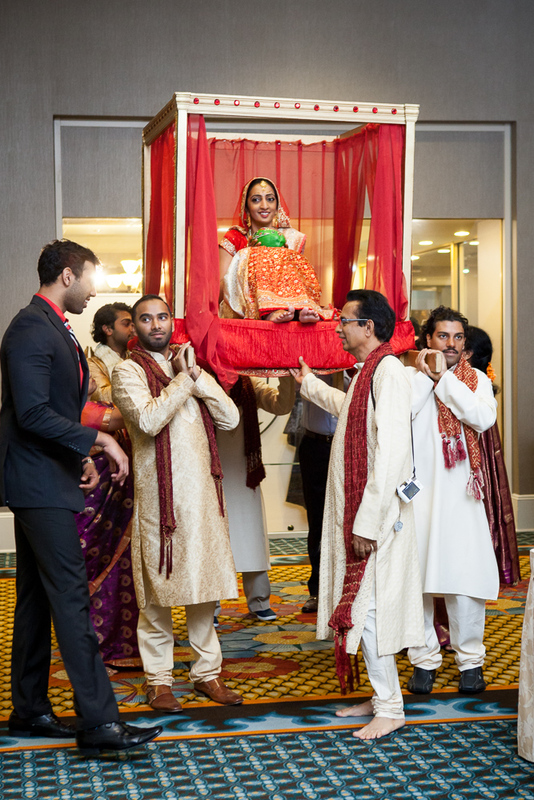 Mrudula was carried to the Mandap and brought to her husband to perform a traditional Hindu ceremony. 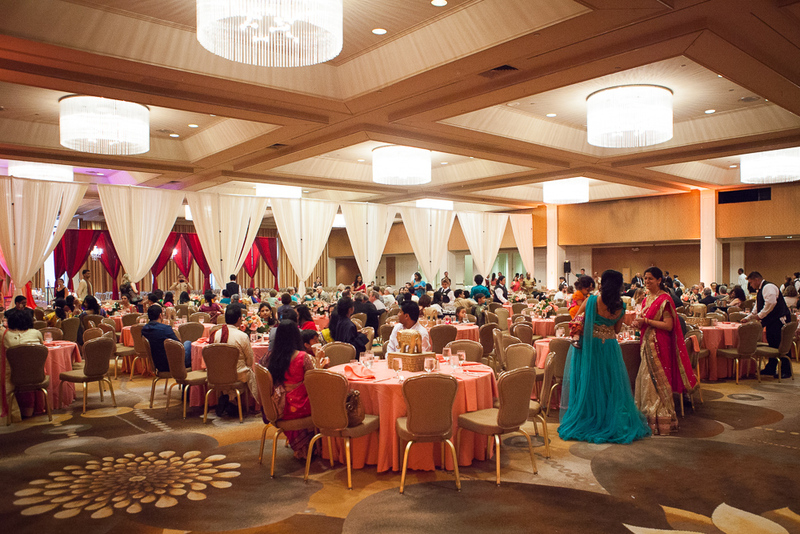 After the ceremony, the draping that split the ballroom was opened to reveal the other side of the ballroom which was delightfully decorated for our luncheon of Indian cuisine. 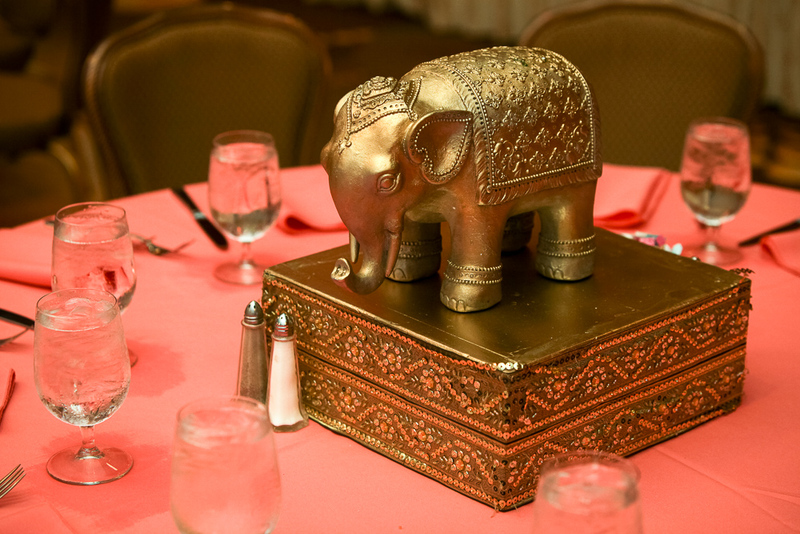 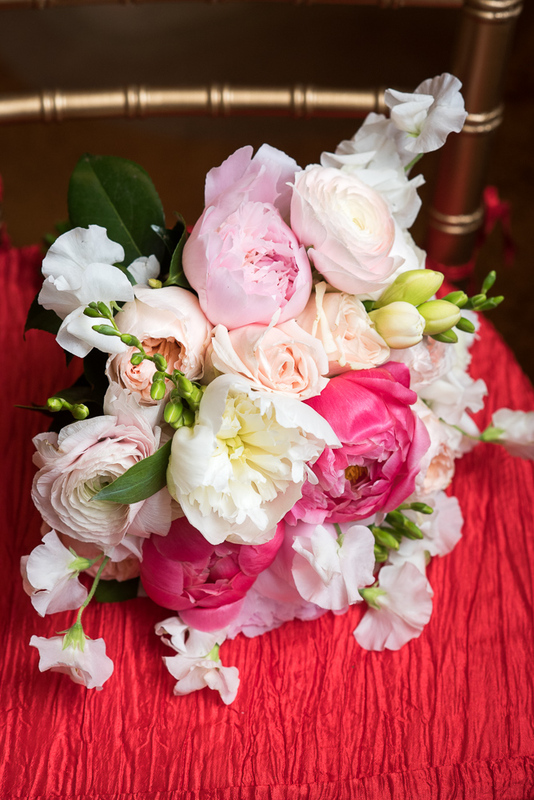 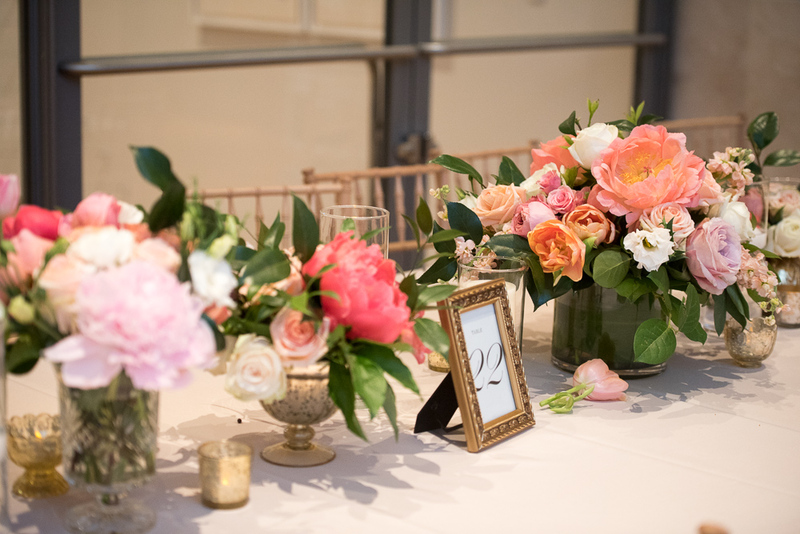 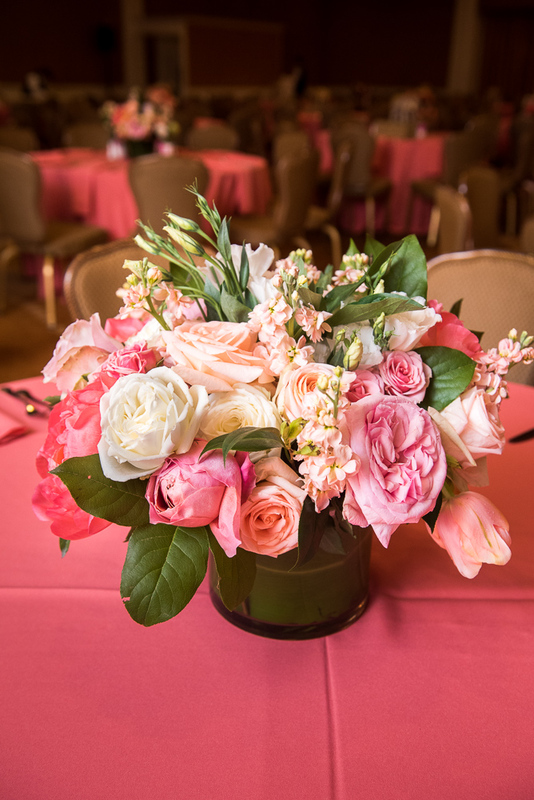 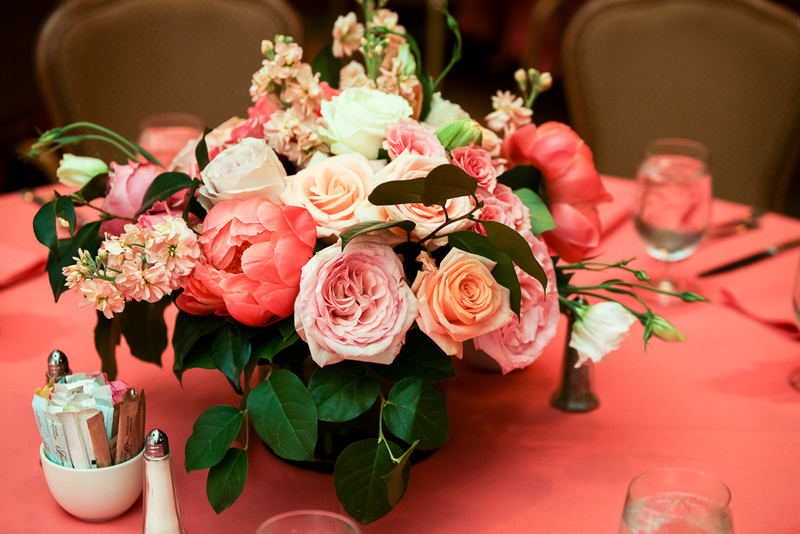 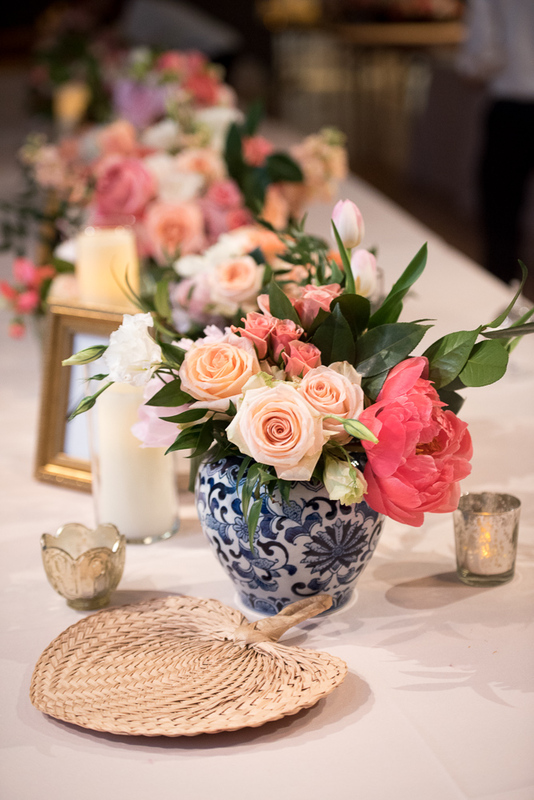 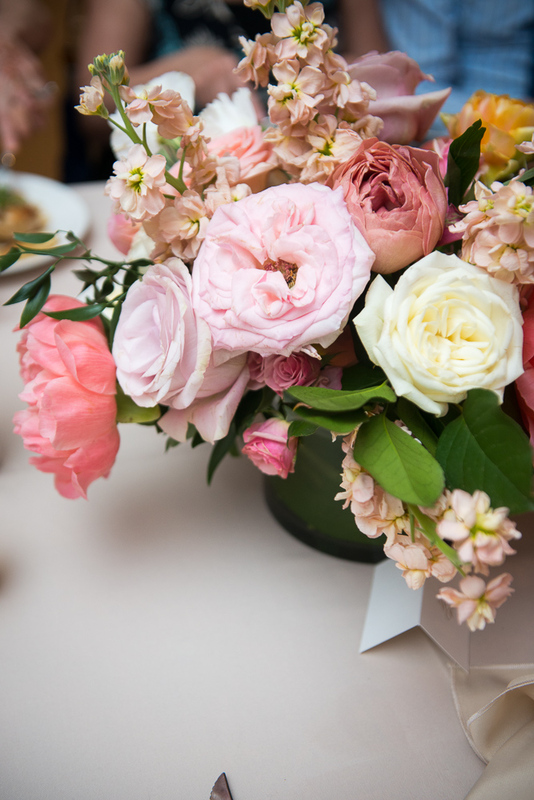 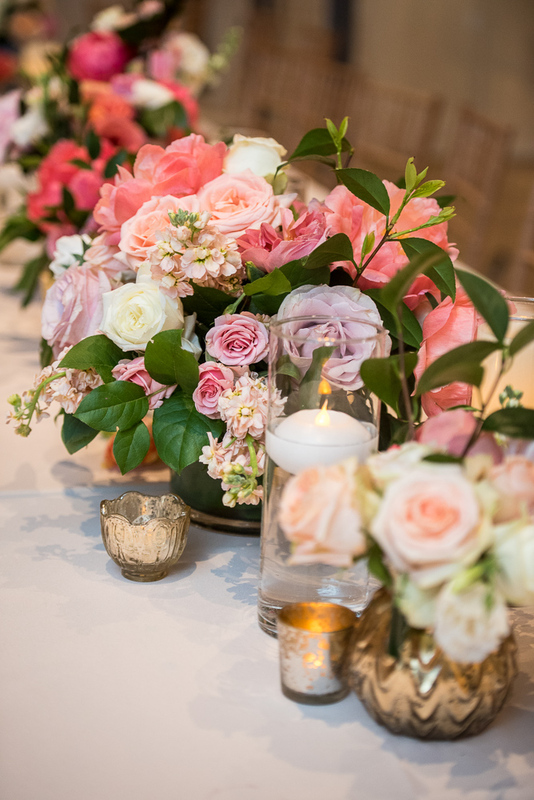 Tables were covered in coral linens and gold elephants and floral arrangements in coral, peach, and pink brightened up the room. 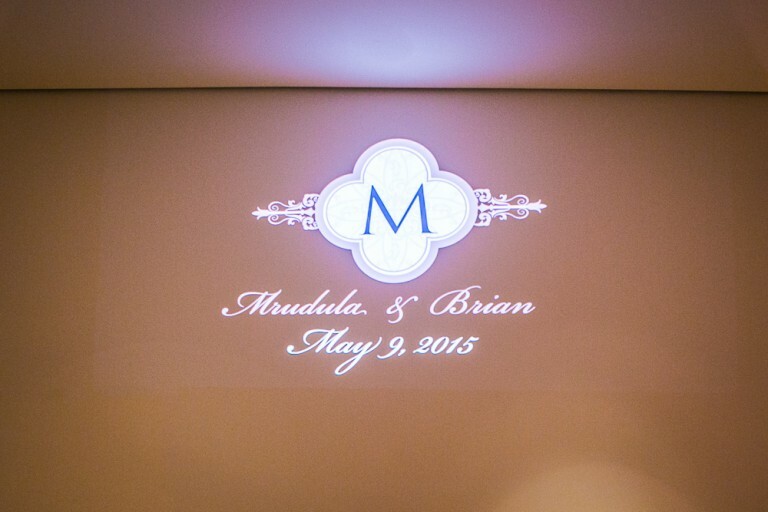 Mrudula and Brian then changed their attire for the second half of their day, with Brian in a tuxedo and Mrudula in a sophisticated white gown. 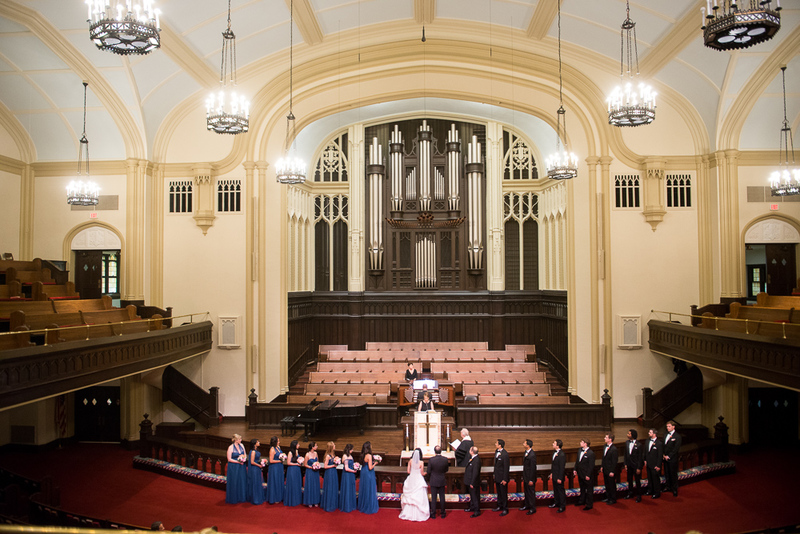 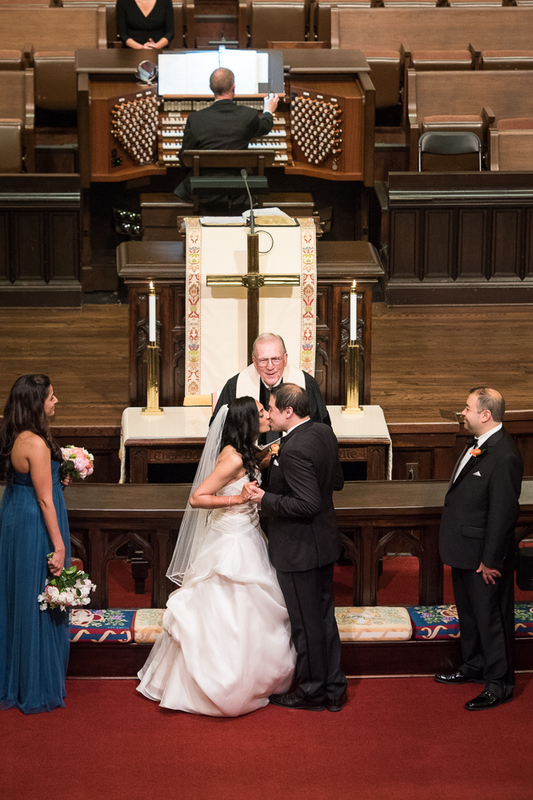 A Christian ceremony was held in a grand Dallas church. 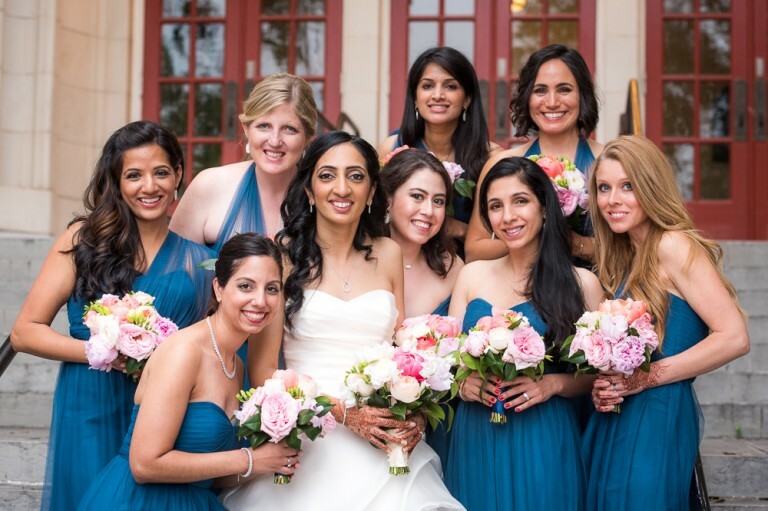 Bridesmaids changed from their coral and gold Saris into lovely bridesmaids’ dresses in cobalt blue which paired so well with the coral, peach, & ivory bouquets all the ladies carried. 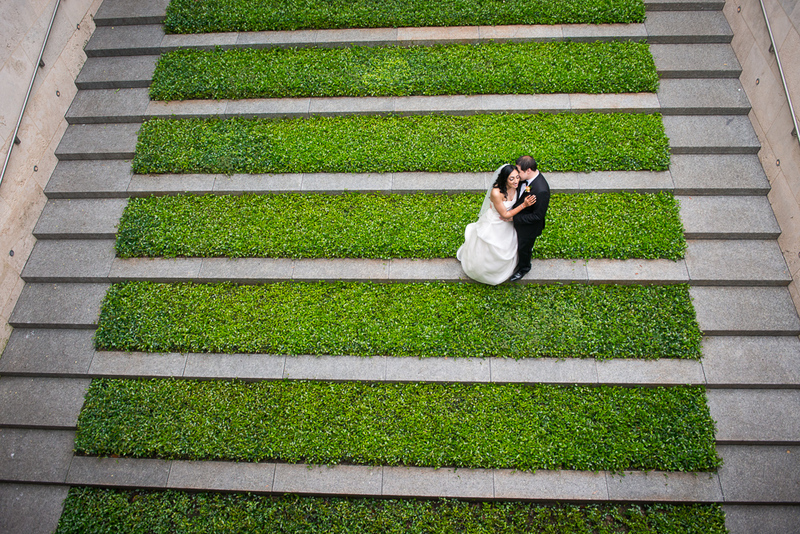 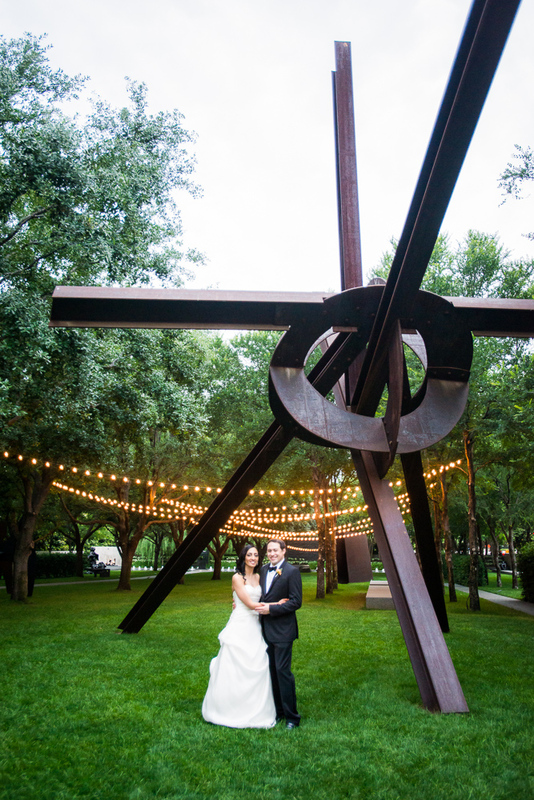 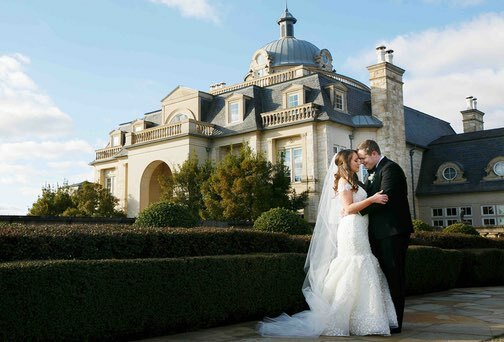 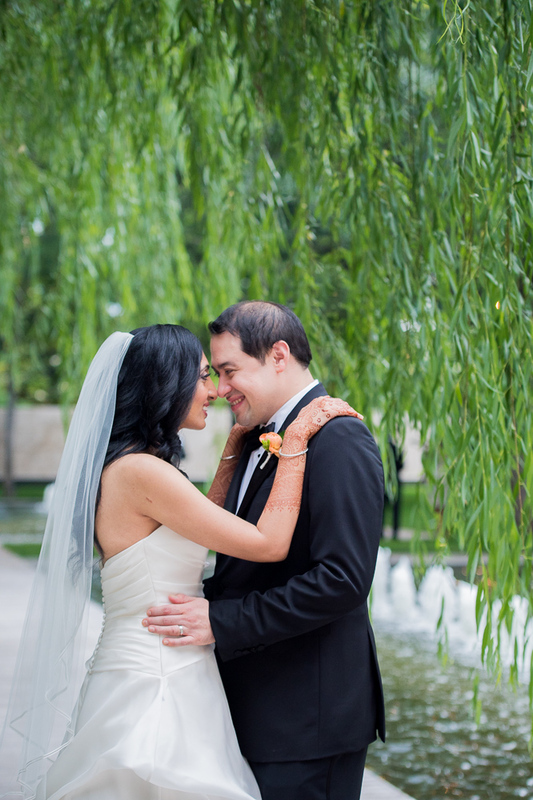 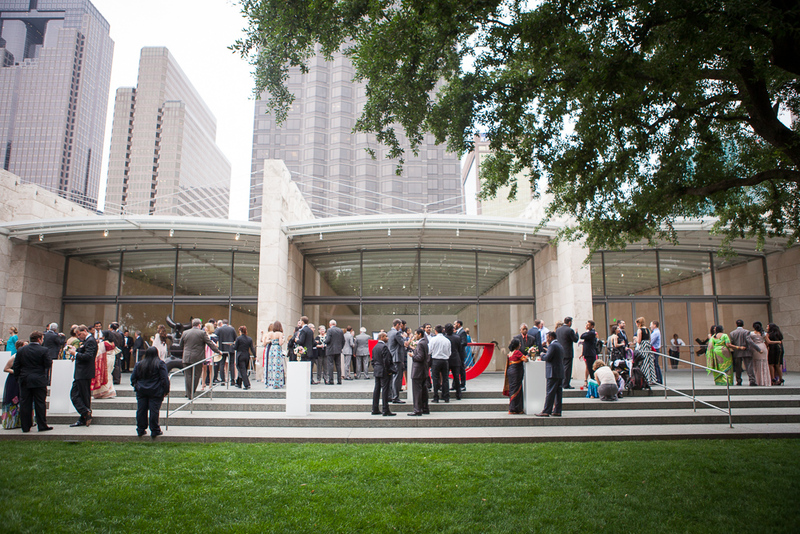 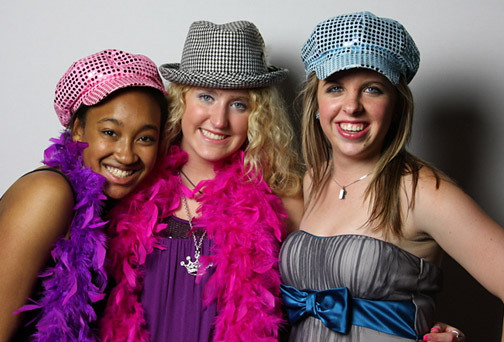 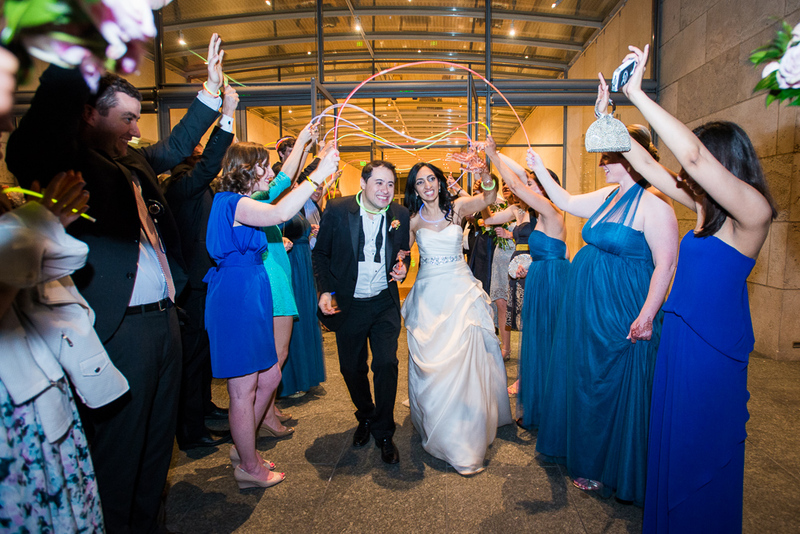 Following the ceremony, guests proceeded to a local art museum and sculpture garden for the reception. 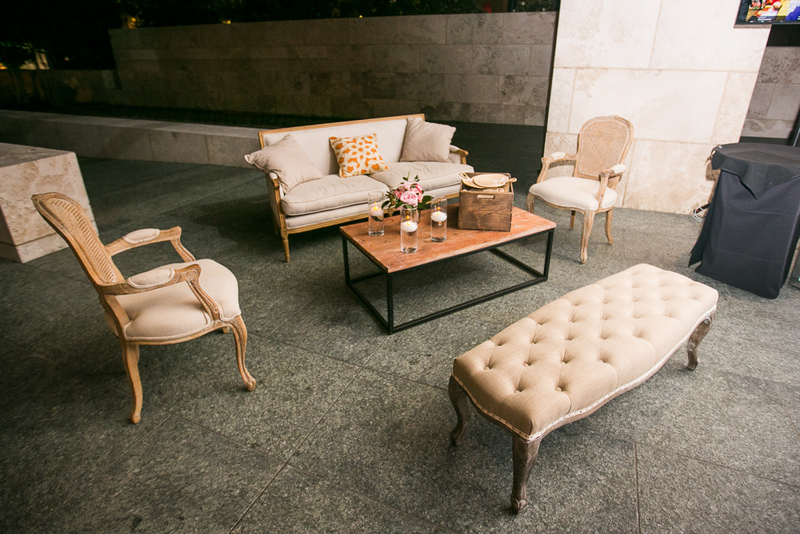 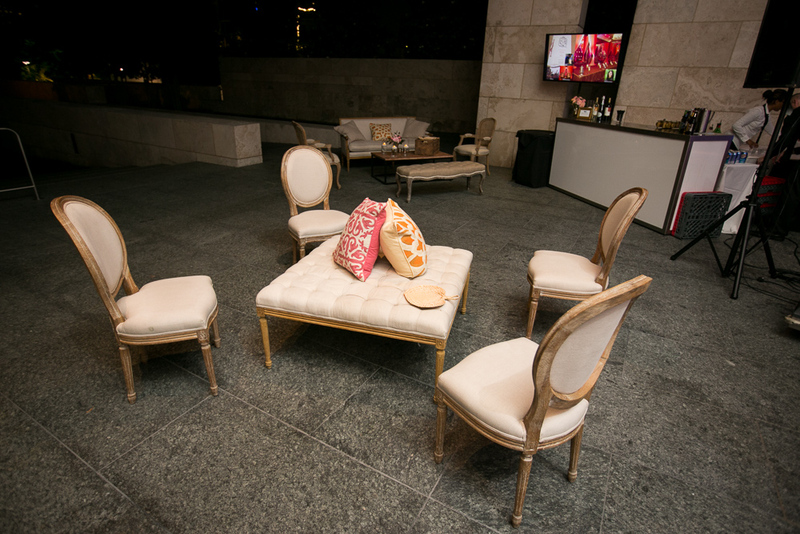 Hors d’ourves and cocktails were passed on the terrace while guests lounged on modern lounge furniture. 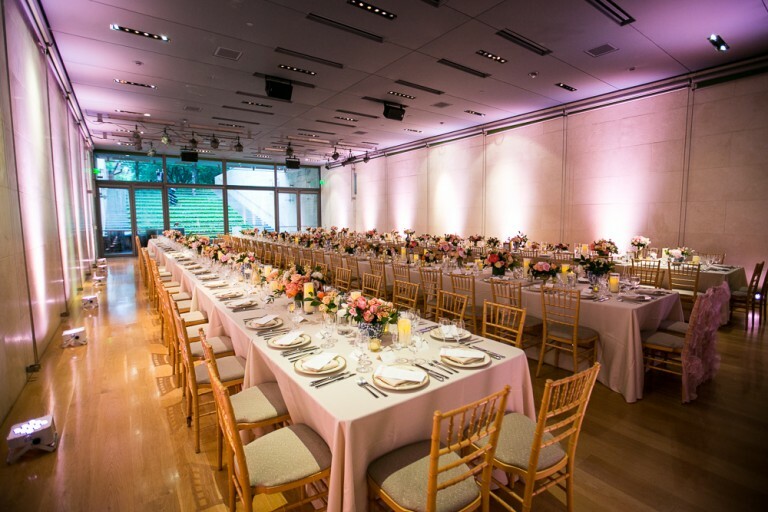 The ballroom was filled with wall to wall long tables with covered in taupe linens and filled with low lush floral in the wedding colors. 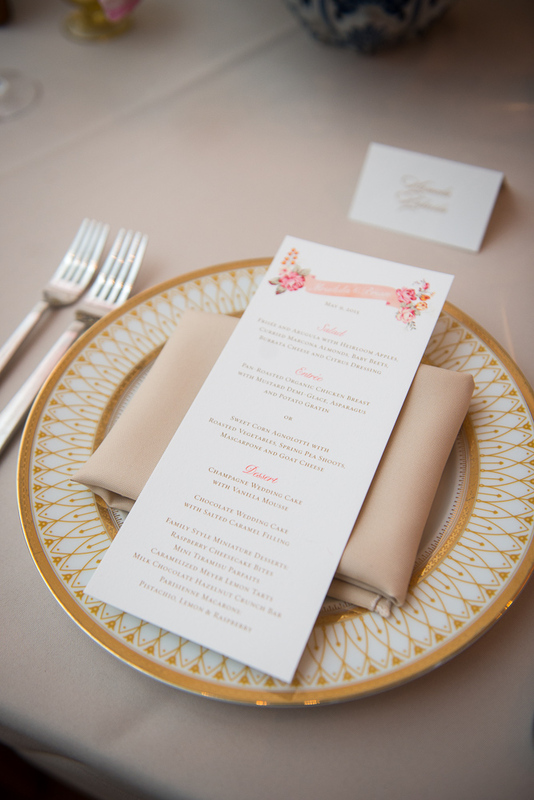 Chic gold and ivory chargers with floral menu cards sat at each place setting, preparing guests for the delicious plated meal. 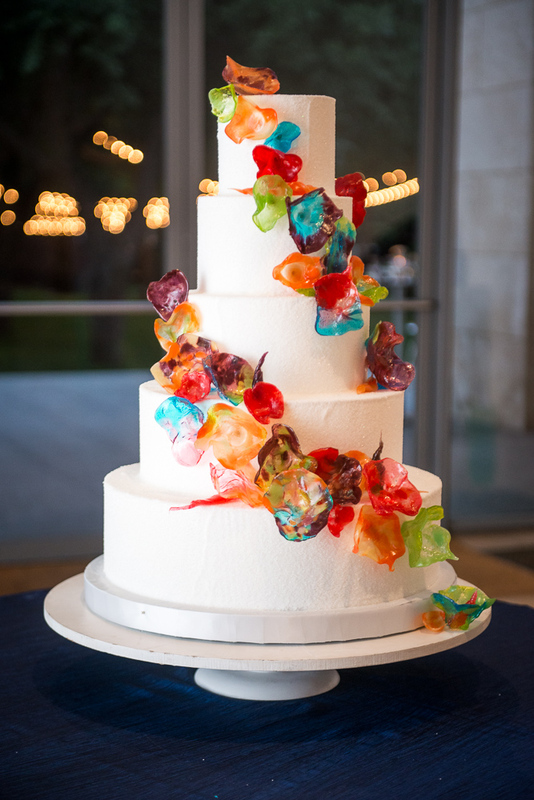 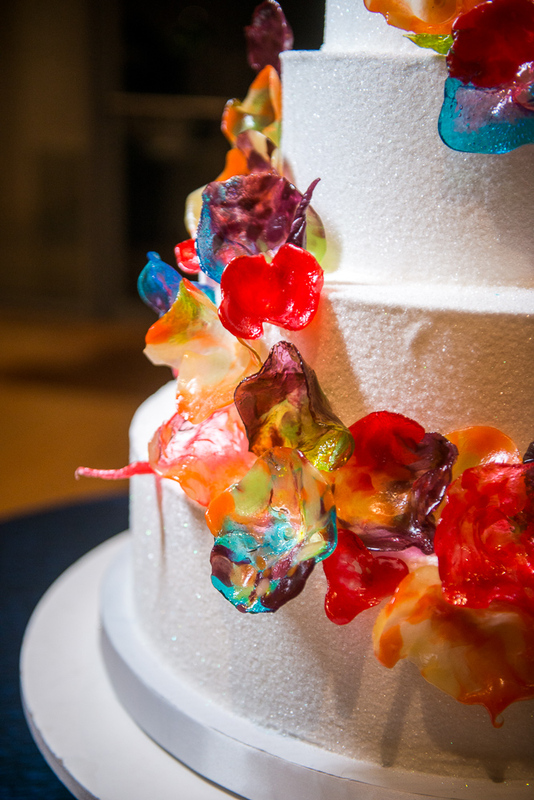 Their wedding cake was truly a work of art, with blown sugar resembling the glass sculpture work of Dave Chihuly. 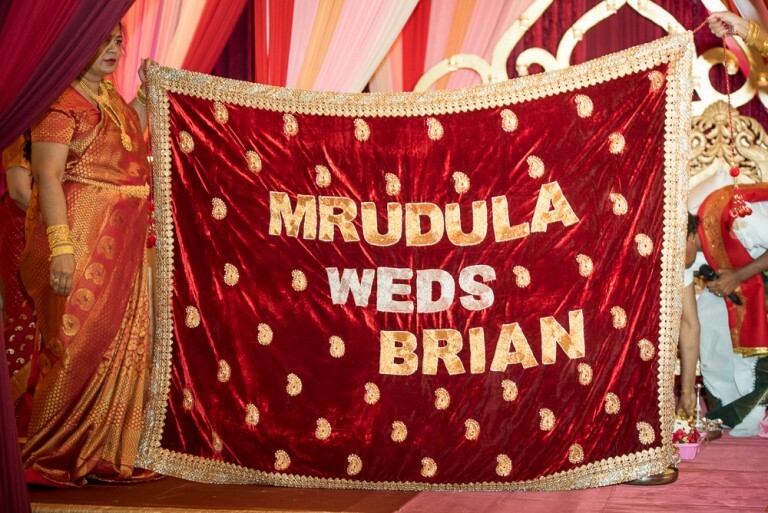 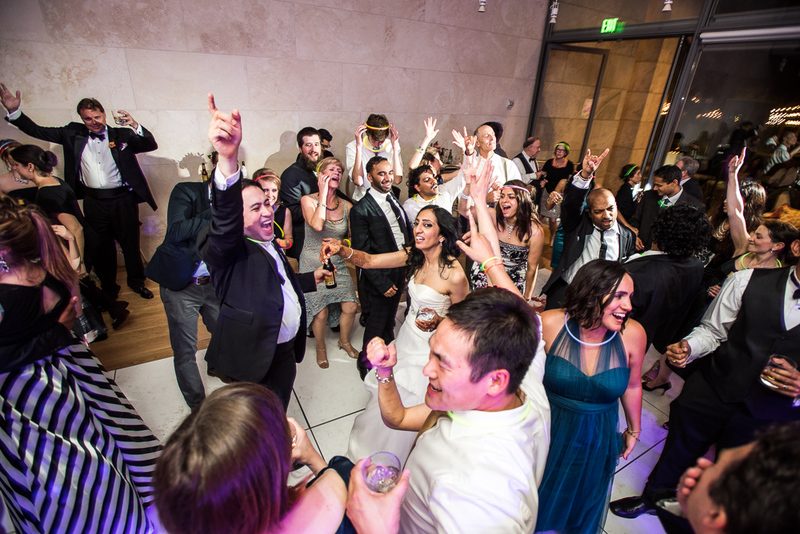 A live band got the party rocking as guests danced the rest of the evening before sending Mrudula and Brian off at the end of their fun-filled day of celebration. 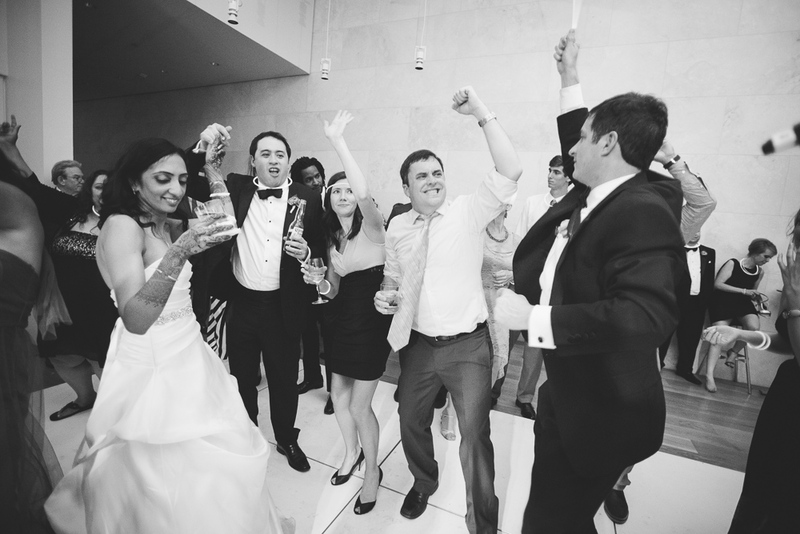 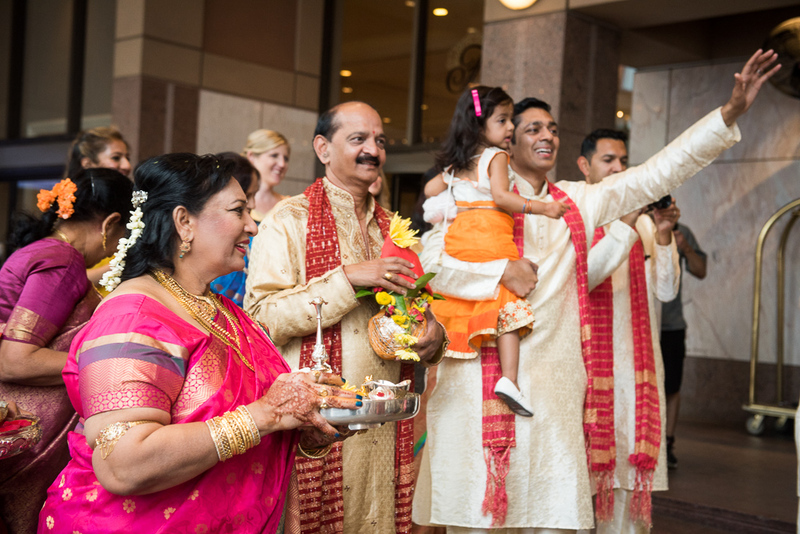 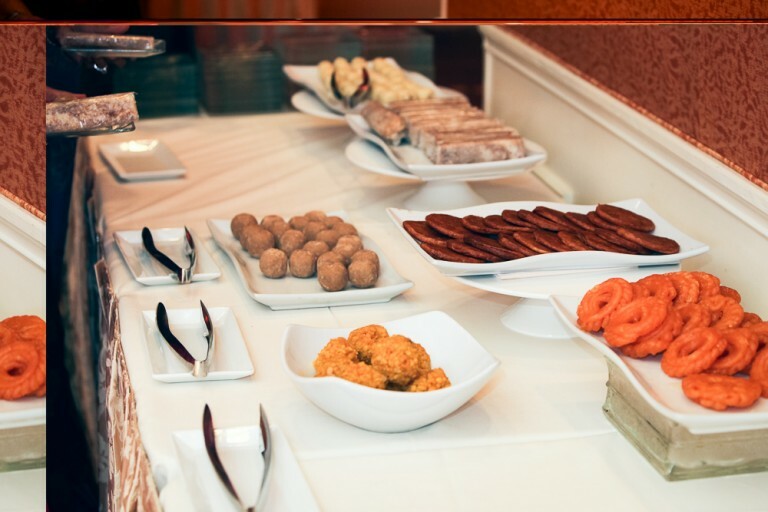 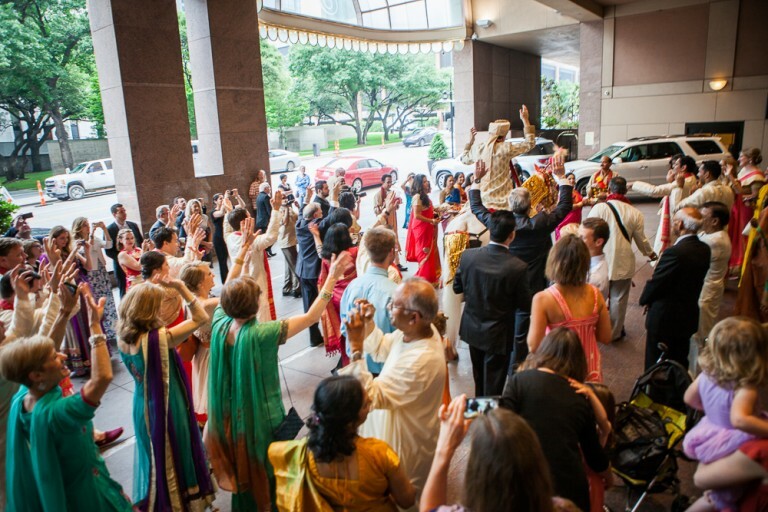 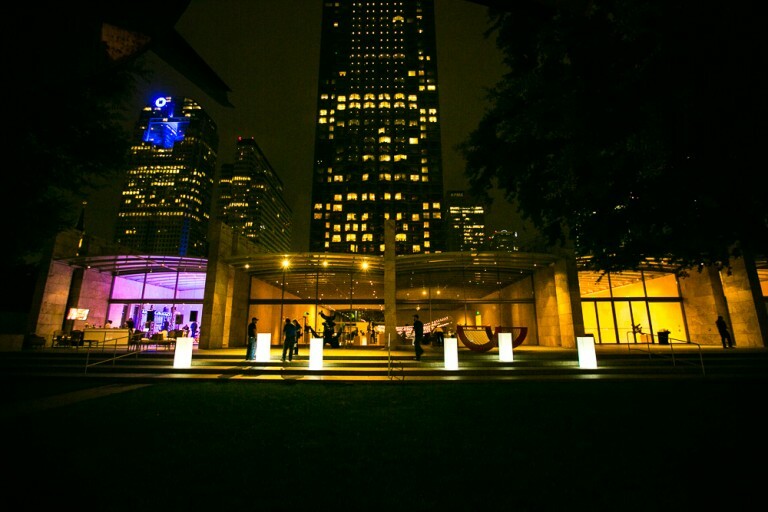 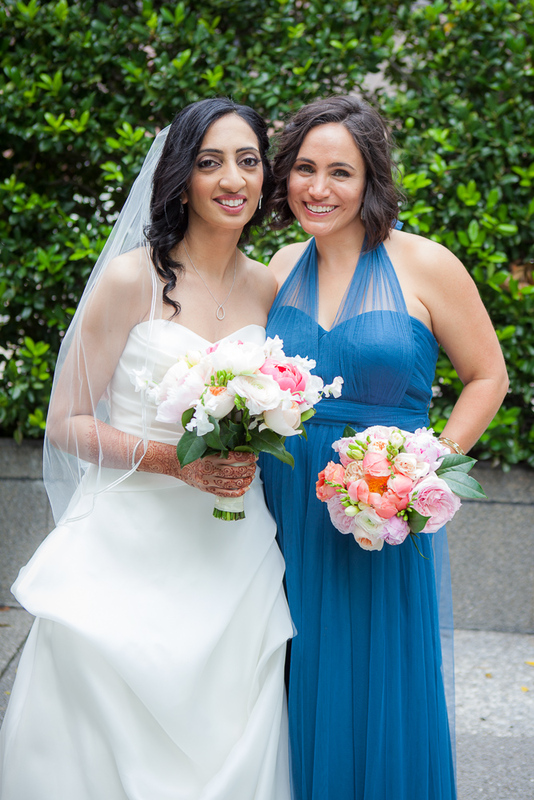 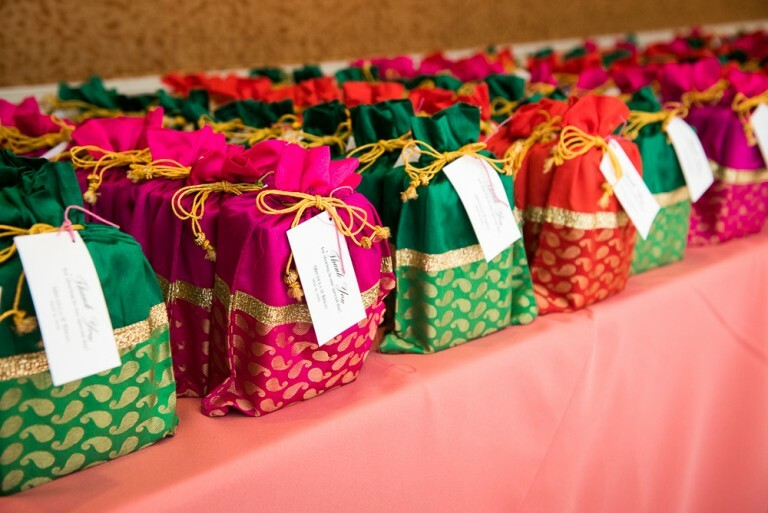 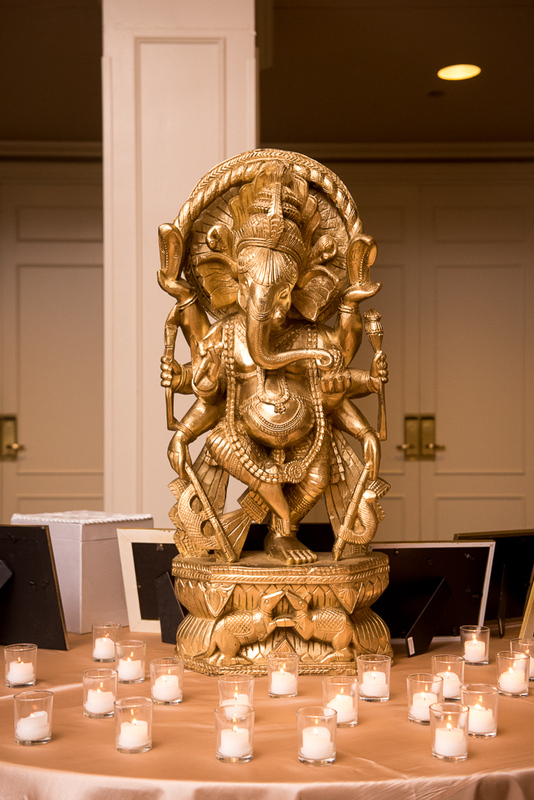 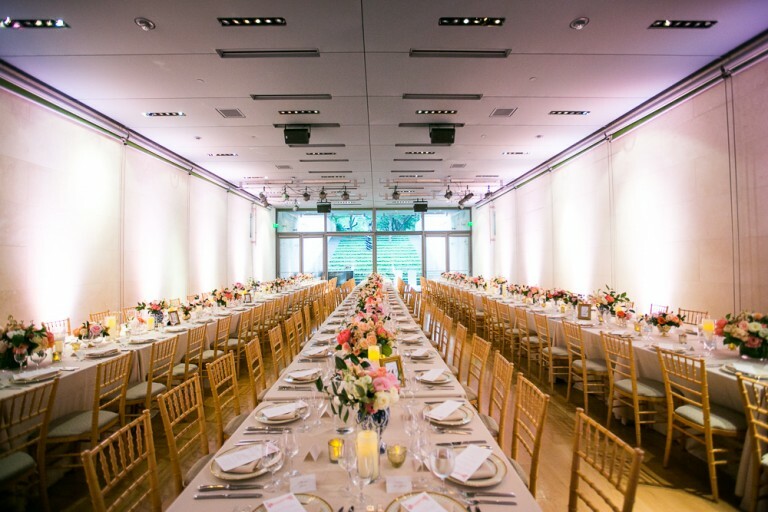 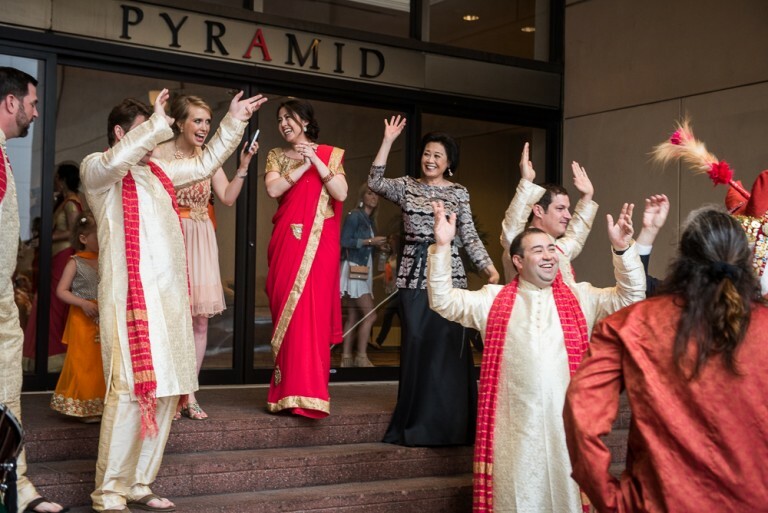 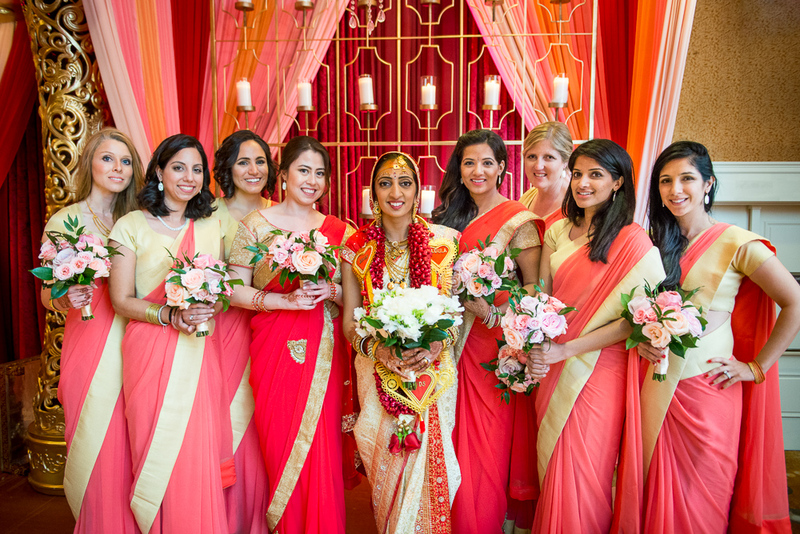 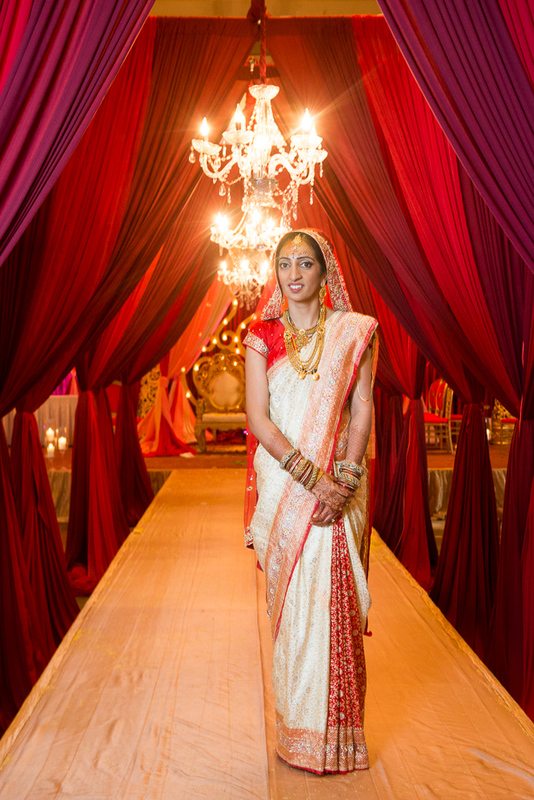 This entry was posted in Weddings and tagged Fairmont Dallas Wedding, First United Methodist Dallas Wedding, Hindu Wedding, Indian Wedding, Interfaith Wedding, Nasher Sculpture Center Wedding, Ombre Wedding, Peach Coral & Pink Wedding. Bookmark the permalink.